Newcomer. 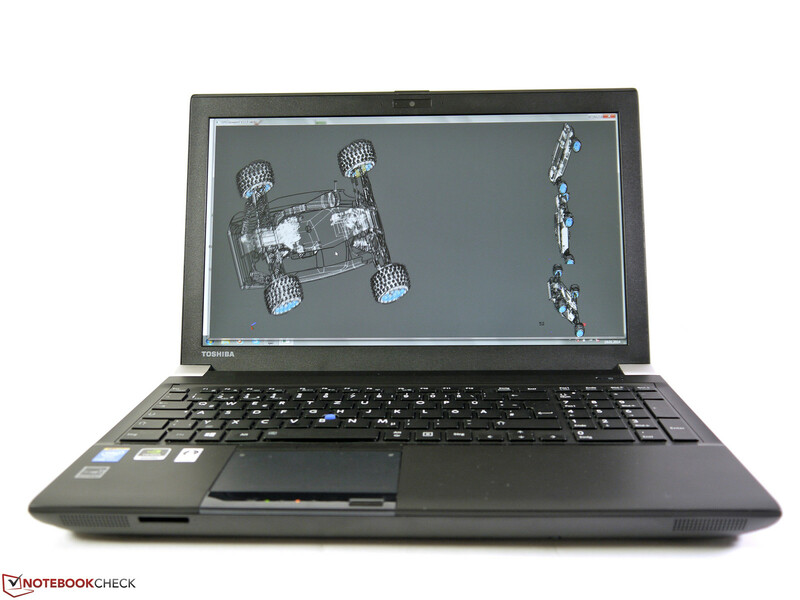 Toshiba gets into the market of mobile workstations and offers a very well-equipped device with the Tecra W50-A-104. Does the well-known competition need to be afraid? We will find out in our review. 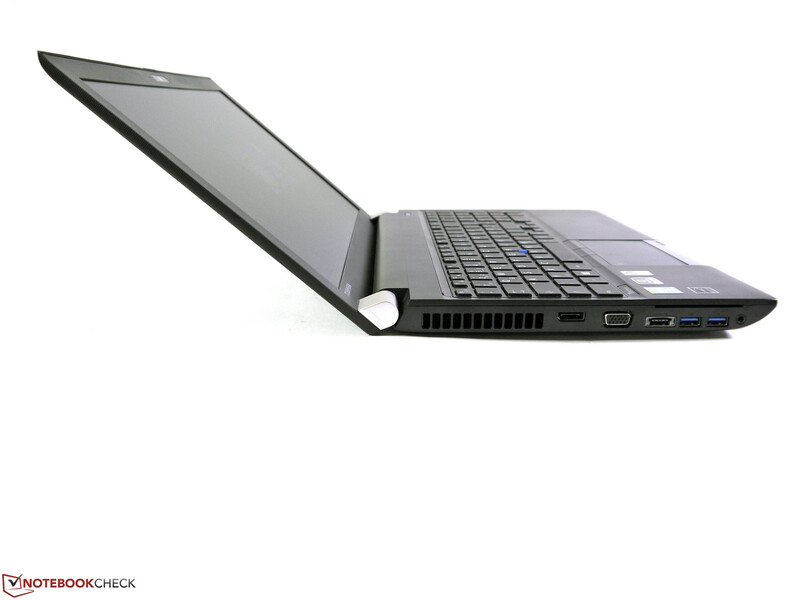 The Toshiba Tecra W50 is a 15-inch mobile workstation and is primarily competing with rivals like the HP ZBook 15, the Dell Precision M4800 or the Lenovo ThinkPad W540. 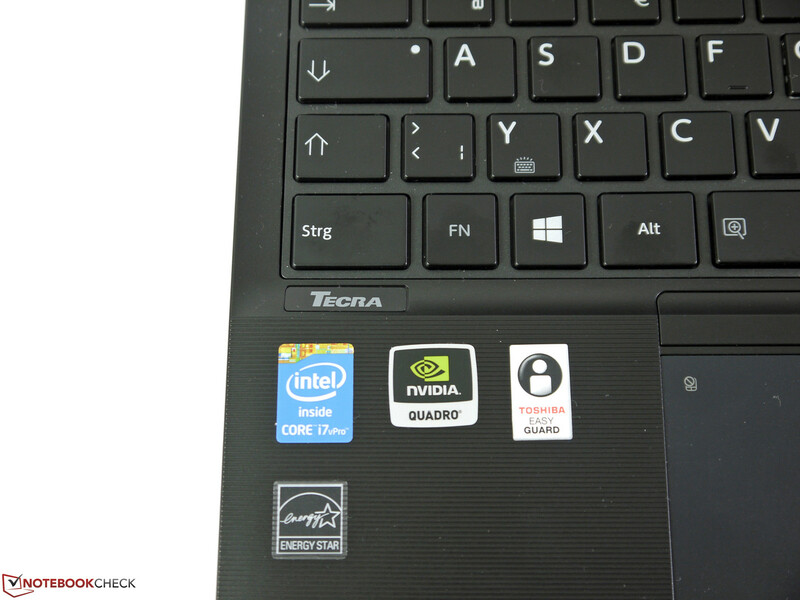 However, possible rivals for the Toshiba Tecra W50 also include even more powerful 17-inch workstations or ultrabook-like versions with better mobility. 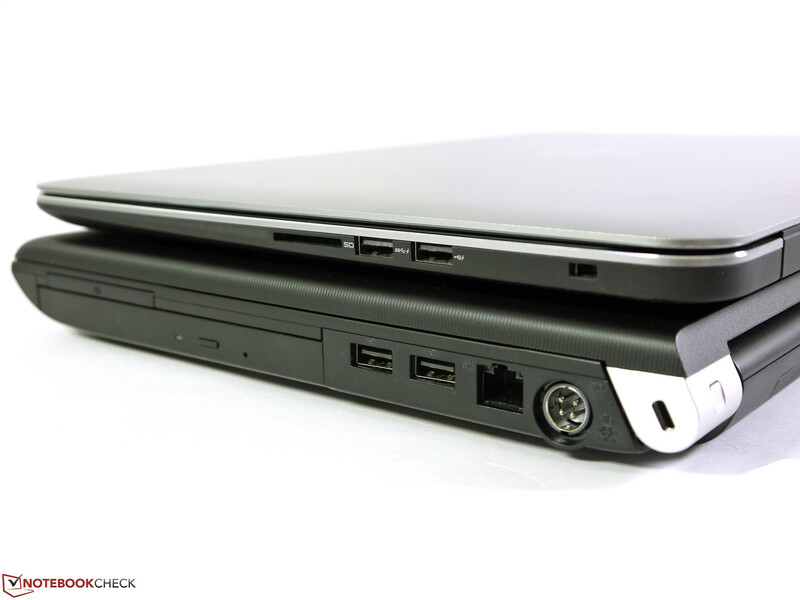 Such devices are, for instance, the HP ZBook 17 or the Dell Precision M3800. The target group is clearly defined: Professional users with very high requirements in regard to the performance, equipment, build quality, expendability, security, warranty and service options. This does however not come cheap, which is why mobile workstations usually retail for a premium price. According to the spec sheet, the Japanese managed an exciting hardware combination. 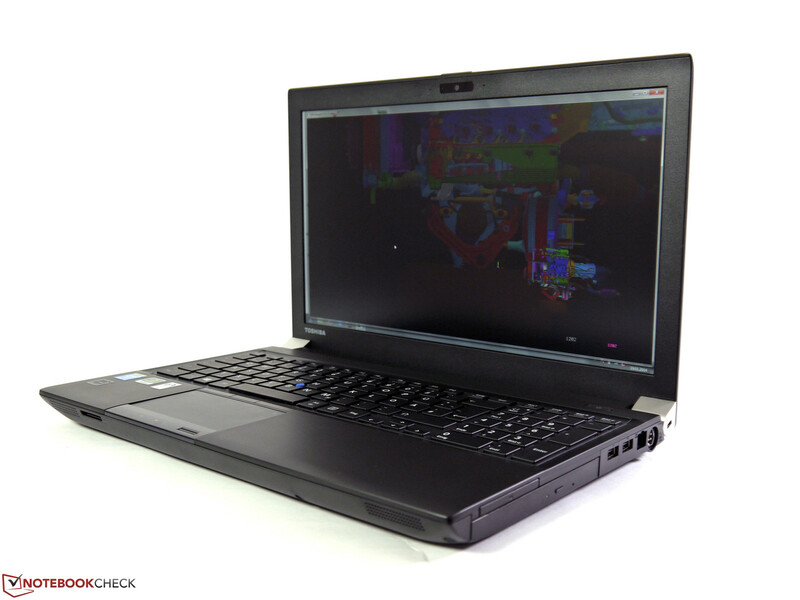 We can find an Intel Core i7-4800MQ CPU, 32 GB RAM, a 1 TB hard drive, an Nvidia Quadro K2100M GPU and a pre calibrated Full HD IPS display. Toshiba's ambitious recommended retail price is 2,900 Euros (~$3954), but the current street price (Internet) is 400 Euros (~$545) lower. 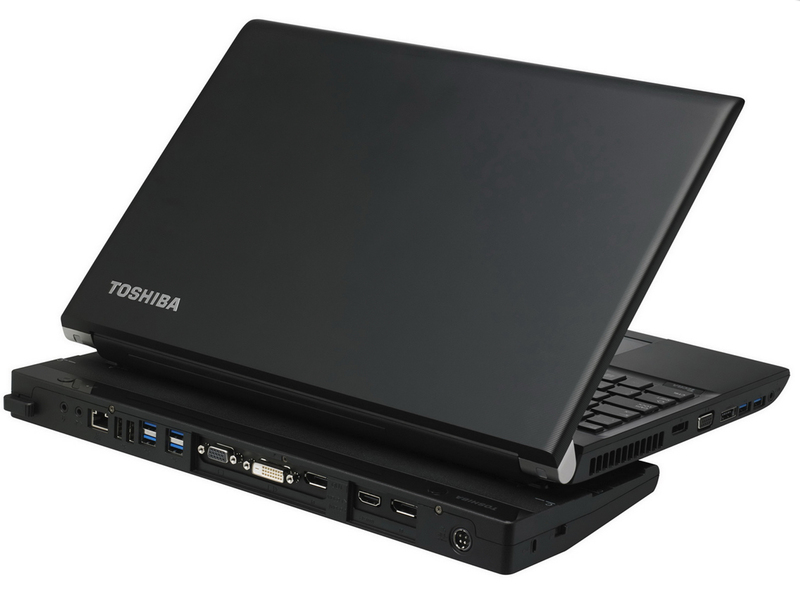 The case of the Toshiba Tecra W50 workstation is not an independent new development; it is already used for the Toshiba Tecra A50, the "normal" business sibling. We cannot really determine any differences in the quality of the case. Most parts of the chassis, including the palm rest, are firm and the structured surface provides convenient haptics. 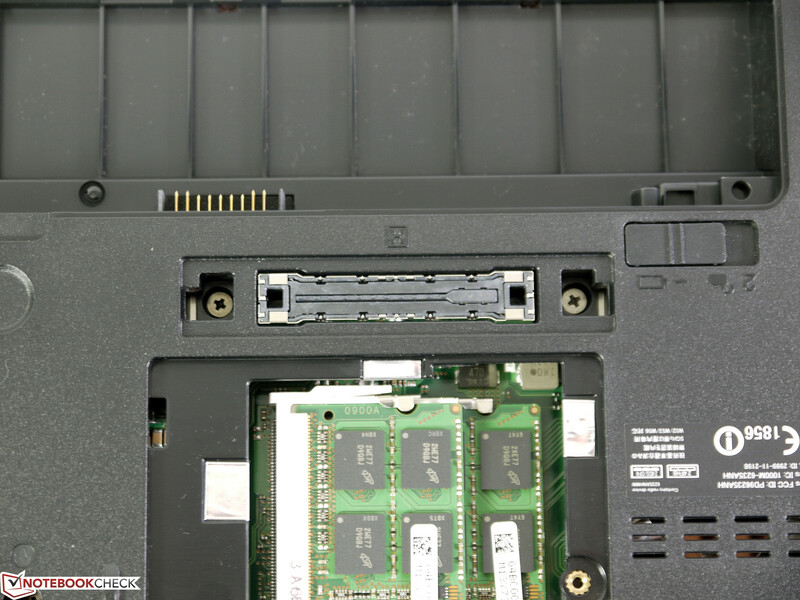 The usual weak spot above the optical drive is an issue of the Toshiba Tecra W50 as well; little force is enough to dent the case in this area. The display hinges could also be slightly firmer, even small movements result in bouncing of the lid. Other issues are the flexible display cover, the limited maximum opening angle and the missing locking mechanism when the lid is closed. 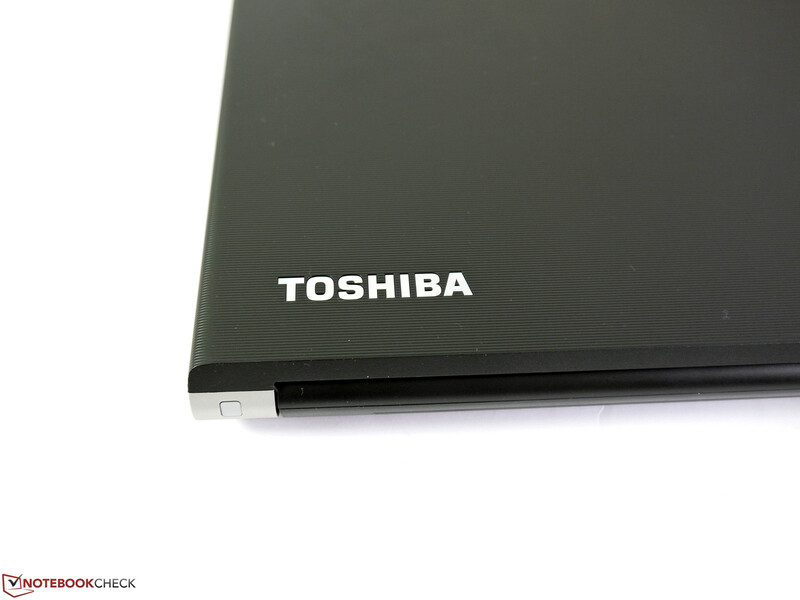 However, Toshiba did a good job concerning the dimensions as well as the weight and shows that even a powerful workstation does not have to be overly heavy and bulky. 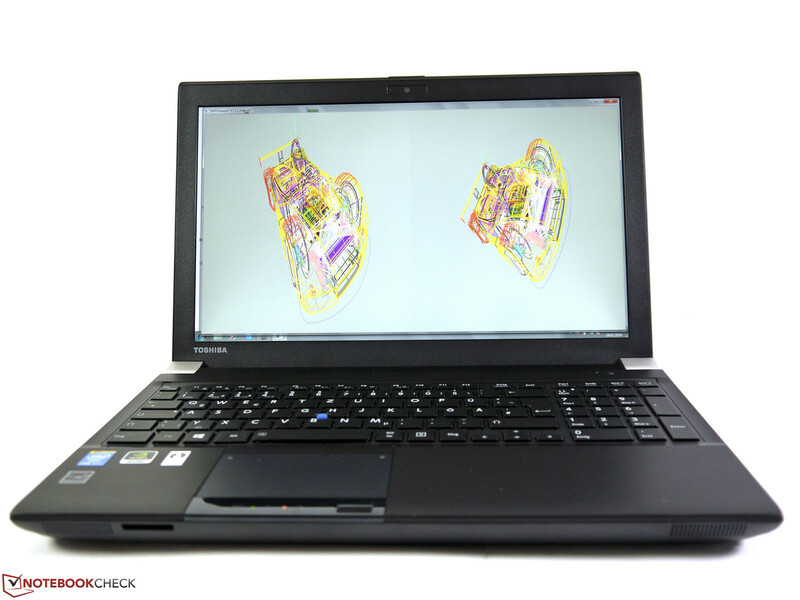 The weight of our review unit is 2.71 kg (~6 pounds) and the dimensions are comparable to standard business notebooks. For comparison: Dell's Precision M4800 weighs a hefty 3.18 kg (~7 pounds) and HP's ZBook 15 (Dreamcolor) is even another 200 grams heavier at 3.38 kg (~7.5 pounds). 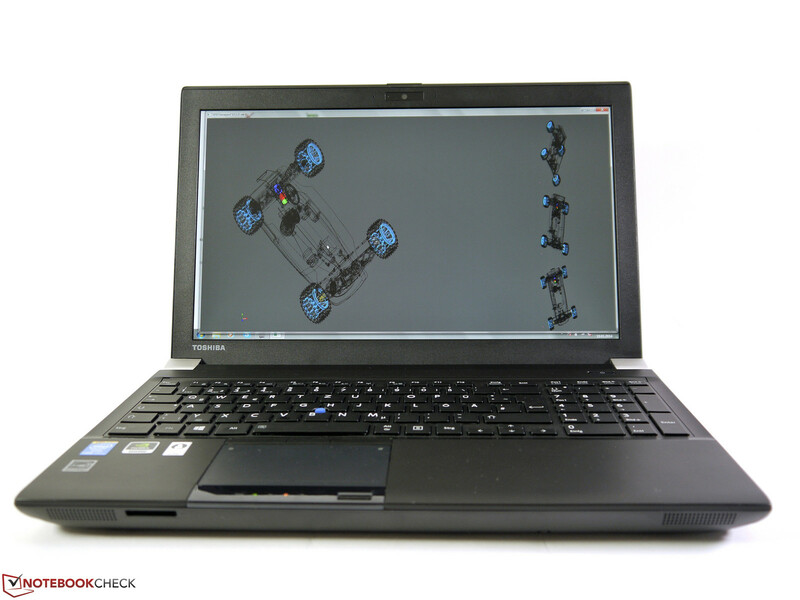 Only Lenovo's ThinkPad W540 manages to be lighter at 2.48 kg (~5.5 pounds). 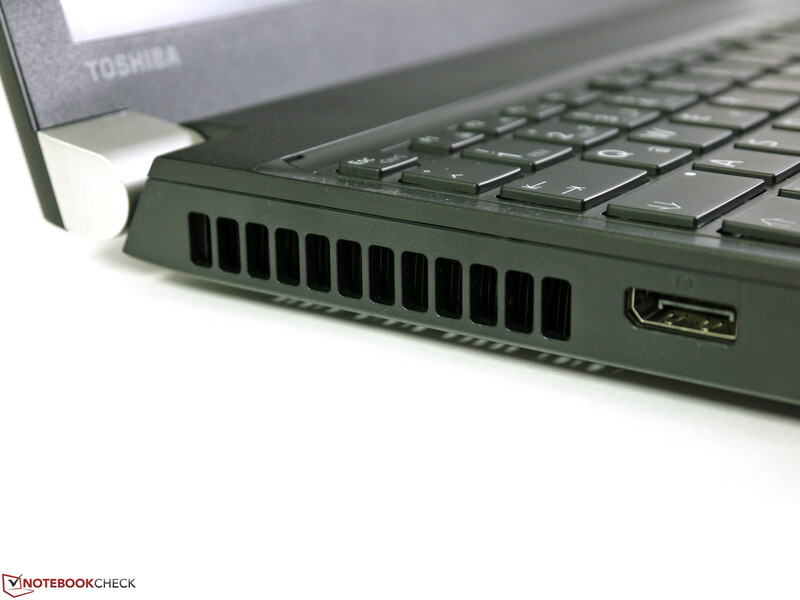 Toshiba's Tecra W50 covers a wide range of ports. 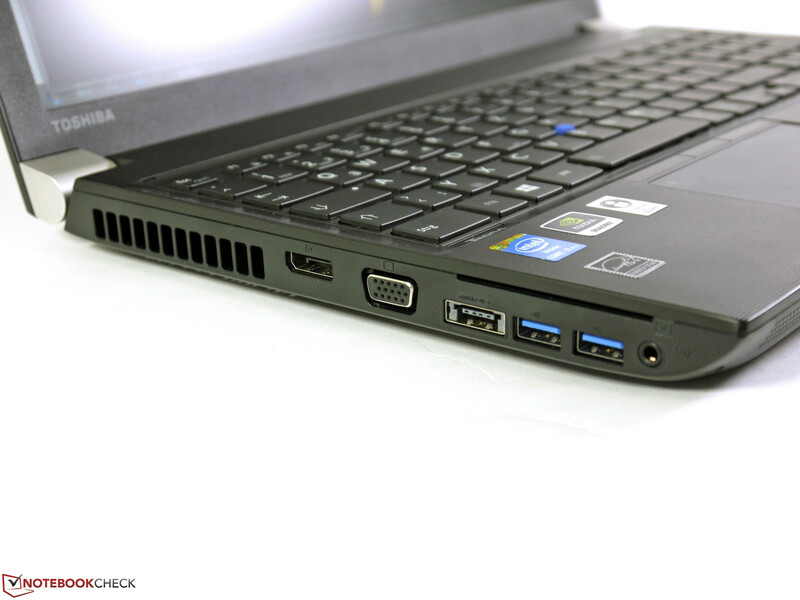 Besides the mandatory USB 2.0 and USB 3.0 ports, our review unit also has an eSATA port, which is rare nowadays. Older hard drives with this connector can therefore be used without any additional adaptors. A dedicated serial port is even much rarer. 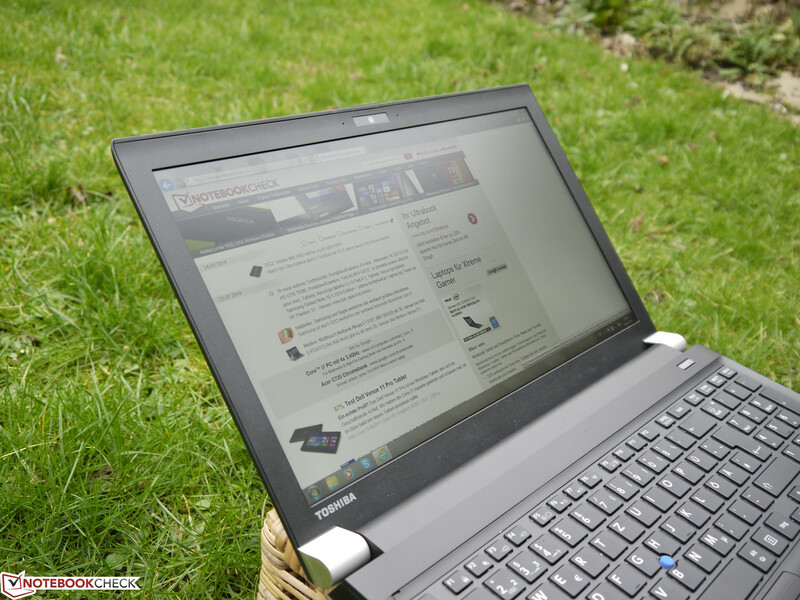 Toshiba only offers it as an option or in specific configurations, respectively, but it is available. 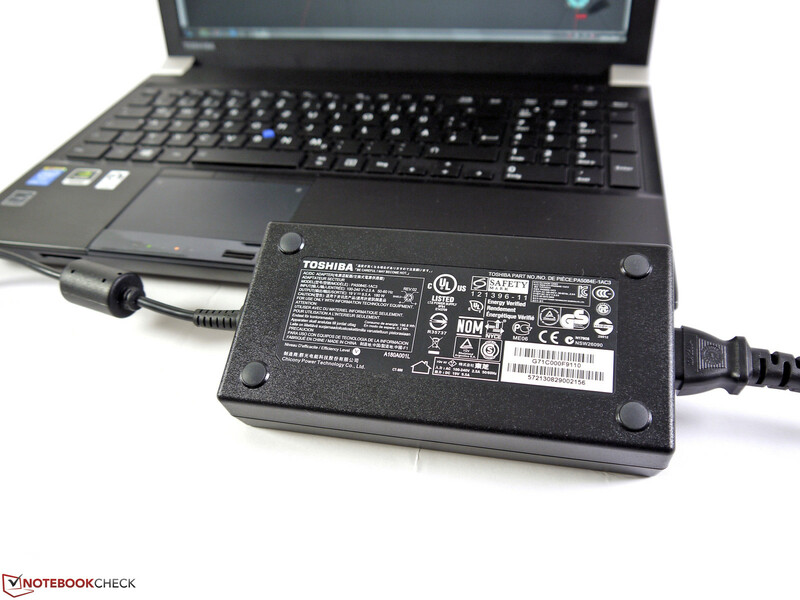 It is often used by service technicians and expands the possible scenarios for the workstation. You do, however lose a USB port on the right side in return. The digital video-out also varies depending on the configuration. 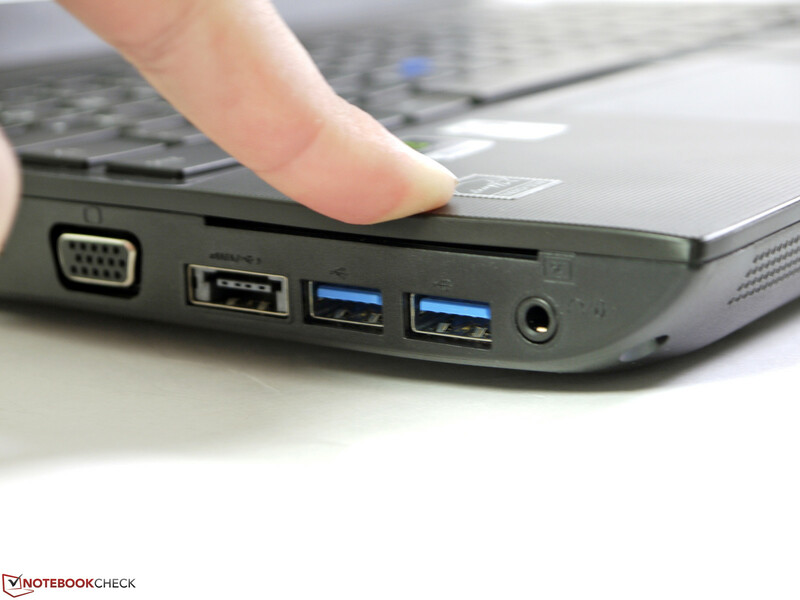 Our review unit has an HDMI port, but a DisplayPort is also possible according to the manual. 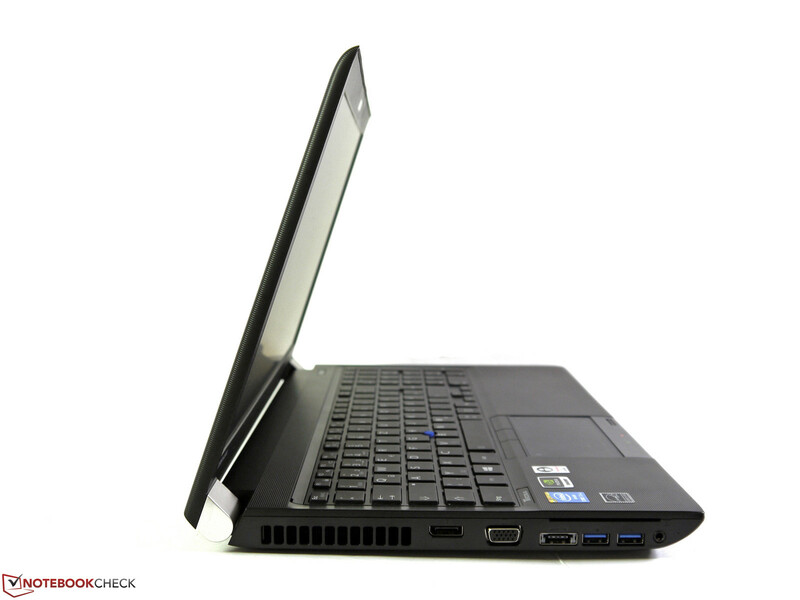 It is also possible that some options are limited to the similar models Tecra A50 or Satellite Pro A50. An analog VGA port can be used for projectors or older external displays and the picture is very sharp with 1920x1080 pixels. 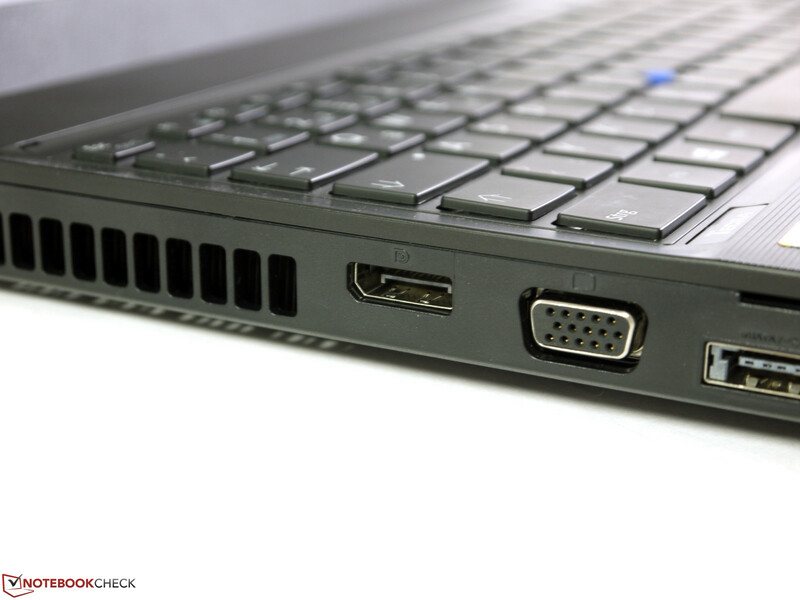 An extension of the integrated ports is possible via ExpressCard/54/34, for example more USB ports or Firewire. The port layout is not perfect for all scenarios. 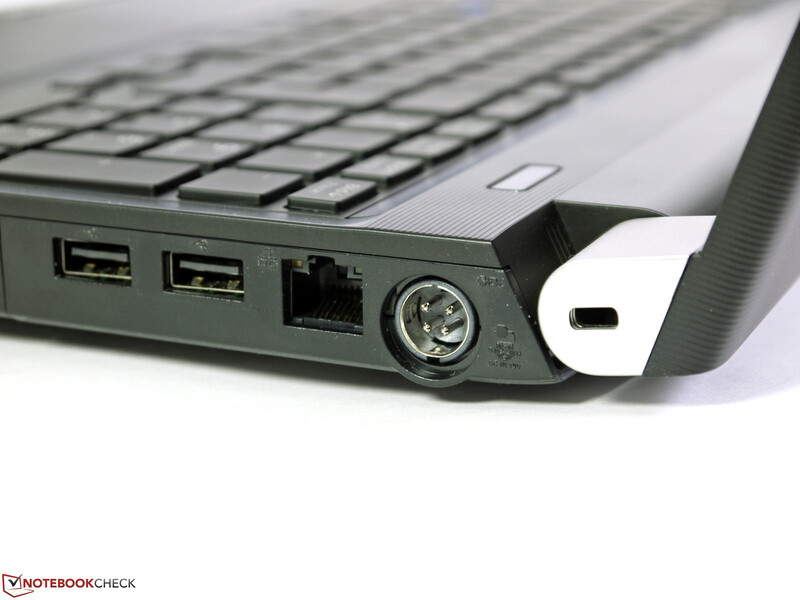 The space between the ports is sometimes limited and bulkier cables or extensions can block the surrounding ports. This is often the case with display cables, USB memory or USB TV sticks. The ports on the left side are also at the front, so attached cables could affect the handling of left-handers. Wireless connections to networks and peripherals of our review unit are handled by Intel's Centrino Advanced-N 6235 module. It works with 2.4 and 5 GHz networks and should support a transfer rate of up to 300 Mbps. Bluetooth 4.0 is already integrated and does not require an additional module. We tested the WLAN performance with a distance of 2.5 and 10 meters (~8.2 and 33 feet) from an 802.11n router. The result is a transfer rate of 4 MB/s up to 5.51 MB/s; we had no problems with unexpected connection losses or a reduced performance. 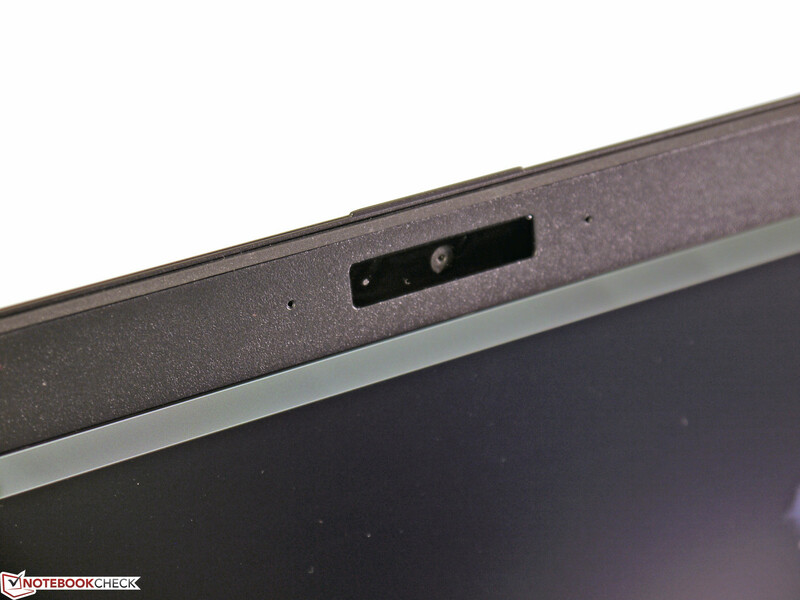 The webcam inside the display frame has a comparatively high resolution with up to 2.0 MP. The picture quality is sufficient for video chats in bright environments and the picture noise is subjectively slightly better compared to many other webcams that we reviewed recently. 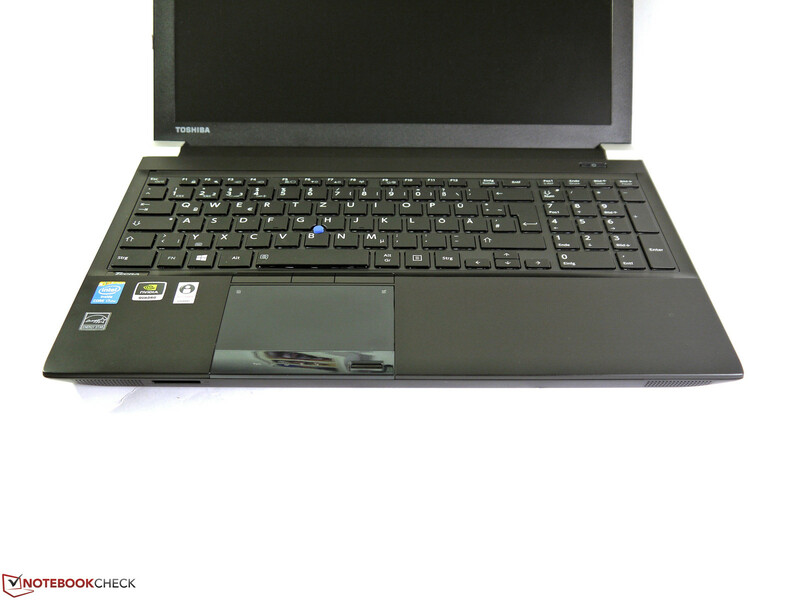 The Toshiba Tecra W50 has solid security equipment besides the usual password options and provided security applications. 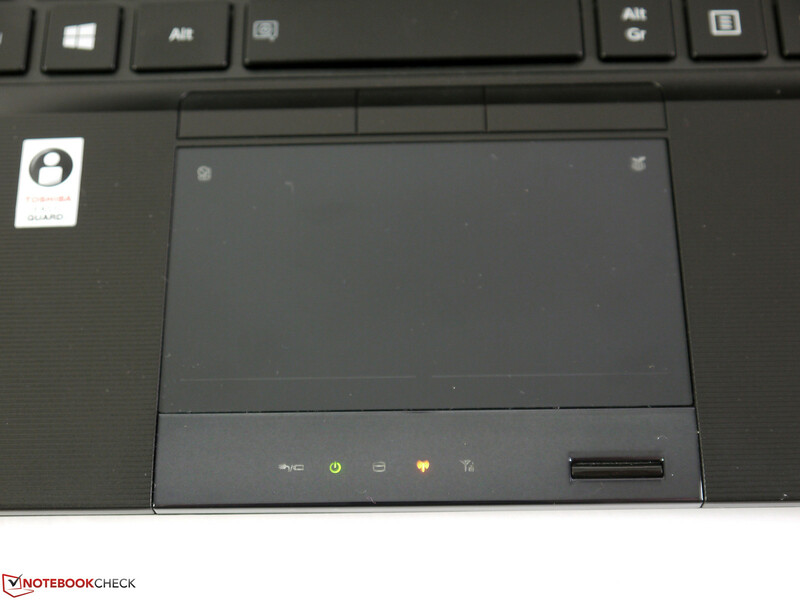 Fingerprint reader, Trusted Platform Module, SmartCard reader and BIOS with Computrace support, represent the current standard for this device class. The hardware is protected by a drop sensor for the hard drive to avoid data loss, a spill-water resistant keyboard and a shockproof case design. 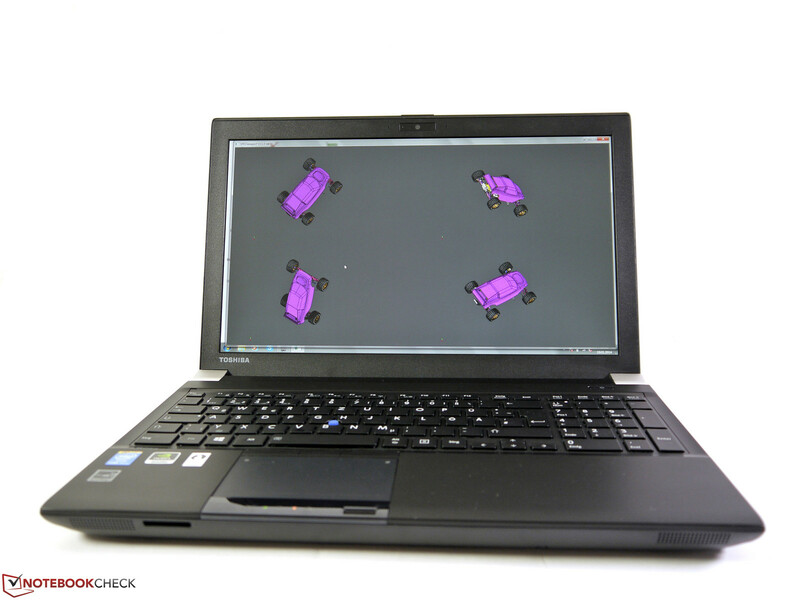 The Tecra W50 is supposed to survive drops from a height of 76 cm (~2.5 feet) without any damage. A Kensington Lock and Intel's Anti-Theft are available to protect against theft. Toshiba's High-Speed Port Replicator III (PA5116E-1PRP) is a docking station, which is compatible with the current Tecra-series. 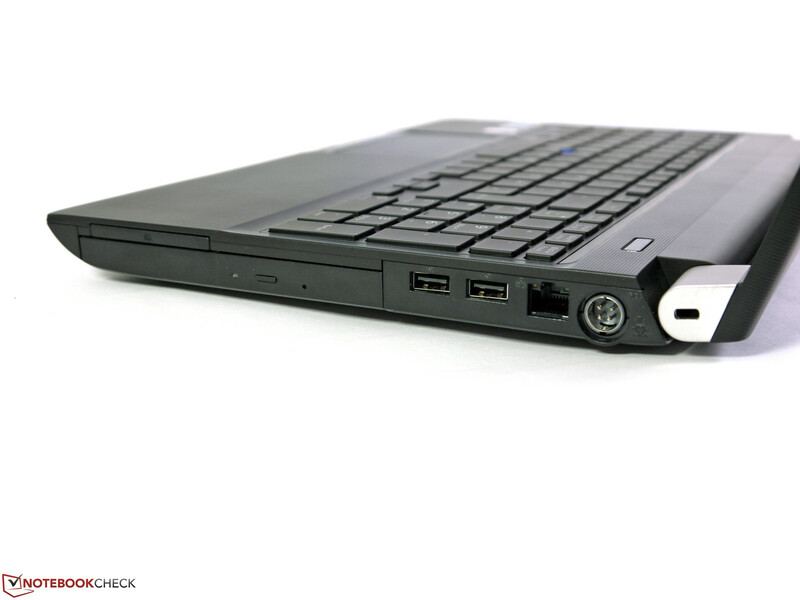 It allows the easy connection of peripherals when you use the notebook on the desk. However, you do not get any additional ports apart from DVI-D and HDMI. The recommended retail price is 250 Euros (~$341) and therefore around 50 Euros (~$68) higher than the current street price. The maintenance cover only reveals the memory and the hybrid hard drive. You have to remove the whole bottom cover to access the other components or the fan. However, you should get information about a possible loss of warranty before you try to replace components. We could not find any information as to which parts can be replaced by the user. Toshiba is very stingy regarding the warranty period. Demanding business customers only get 12 months. Devices from the competition usually have a longer 36-month standard warranty. Toshiba's double warranty can somewhat compensate that. If there is a warranty problem within the first 12 months of the purchase, you not only get a free repair, but also the whole price refunded if you register in time. The "No matter what" warranty (GENB21GA-V) has to be bought and activated within 30 days after the purchase. It expands the standard warranty to three years and includes additional services for a comparatively inexpensive 74 Euros (~$101). 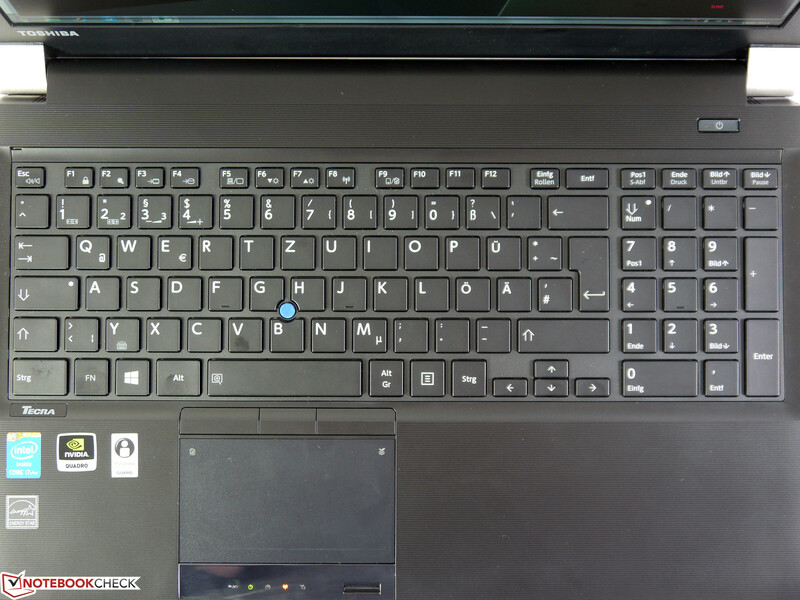 The keyboard of the Toshiba Tecra W50 has 102 keys, including the separate numeric keypad and uses almost the whole width of the case. The comfortable background illumination improves the already good visibility of the high-contrast lettering, especially in darker environments. The keys have a medium to short travel, a distinct pressure point and a pretty firm stroke. Bouncing is only a small issue under heavy force. You will however have to get used to the unusually small space bar. 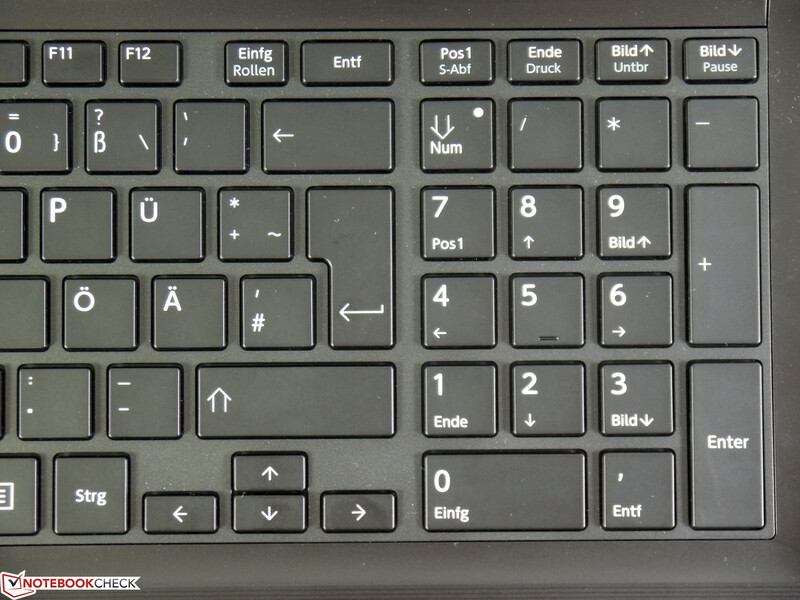 The manufacturer decided to integrate a comparatively large key for the zero of the numeric keypad, so all the other keys have to move to the left and therefore limit the size of the space bar. 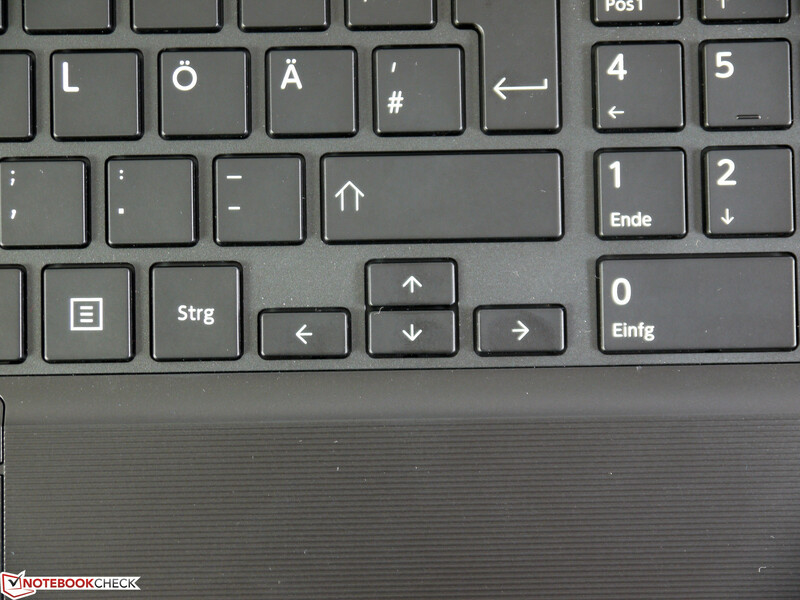 This also results in the small and narrow arrow keys, which are sometimes tricky to hit. The keyboard is still suited for frequent writers and should not be a problem for most users after a little while. 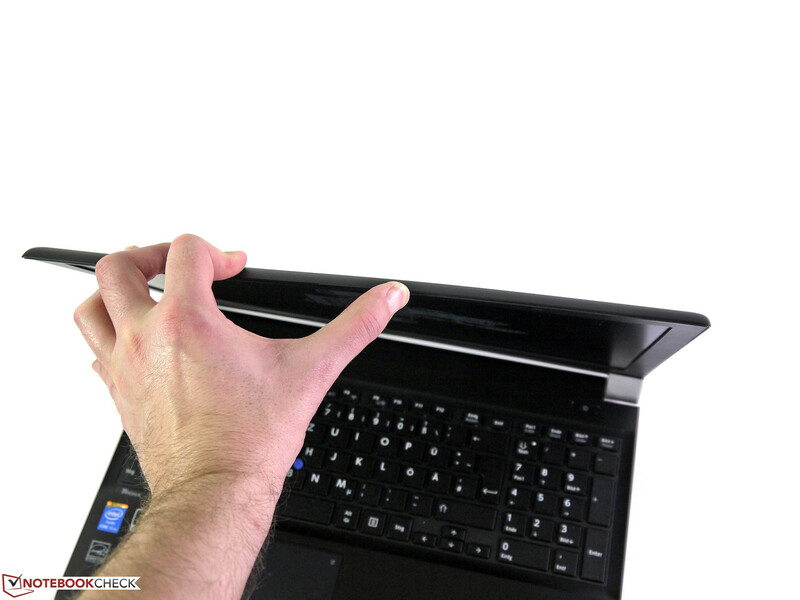 The touchpad is 100 mm x 60 mm (~3.9 x 2.4 inches) and is large enough even for the majority of gestures. Responsiveness and precision are very good and enable a smooth operation. 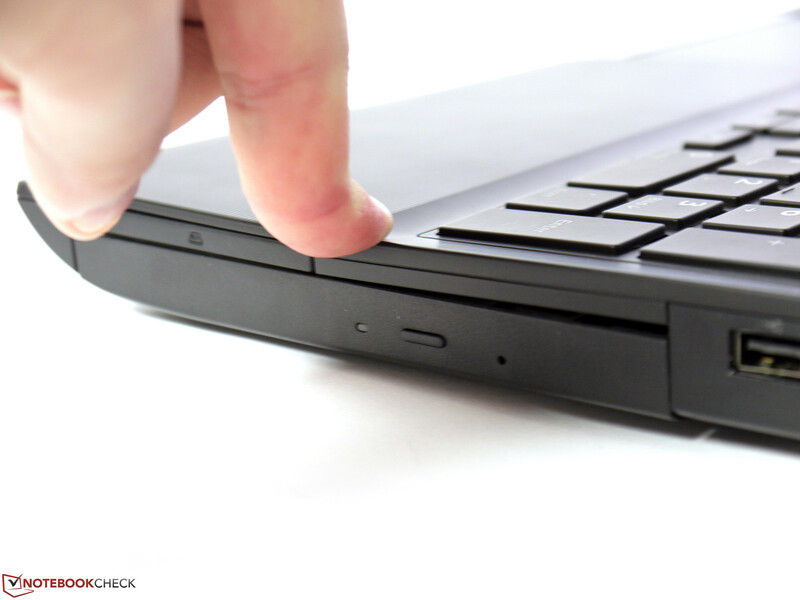 The touchpad buttons are integrated into the touchpad and work well; inputs are reliable. The status bar with LEDs and the fingerprint reader in front of the touchpad might be annoying at first, but you will get used to it. A bigger problem for some users could be the position. It is very far toward the left and could affect the handling if you are not used to it. 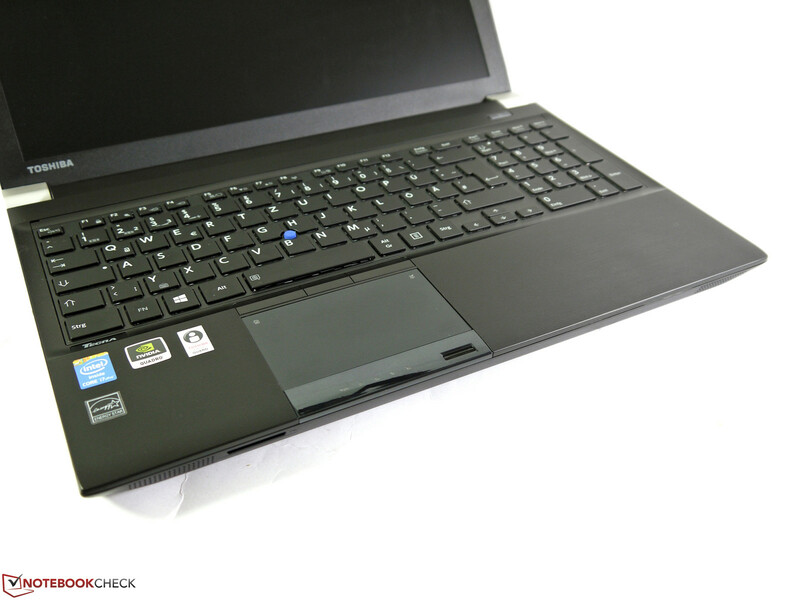 This is a premium business notebook, so the user also gets a TrackPoint as an additional input device. It requires some training, but you get a very accurate and fast input in return. The TrackPoint mouse buttons are a little narrow but you can still use them without problems. All in all, a nice addition to the other inputs. According to the manufacturer, our review unit is equipped with a pre-calibrated IPS display and is supposed to convince us with good viewing angles and very good color accuracy. 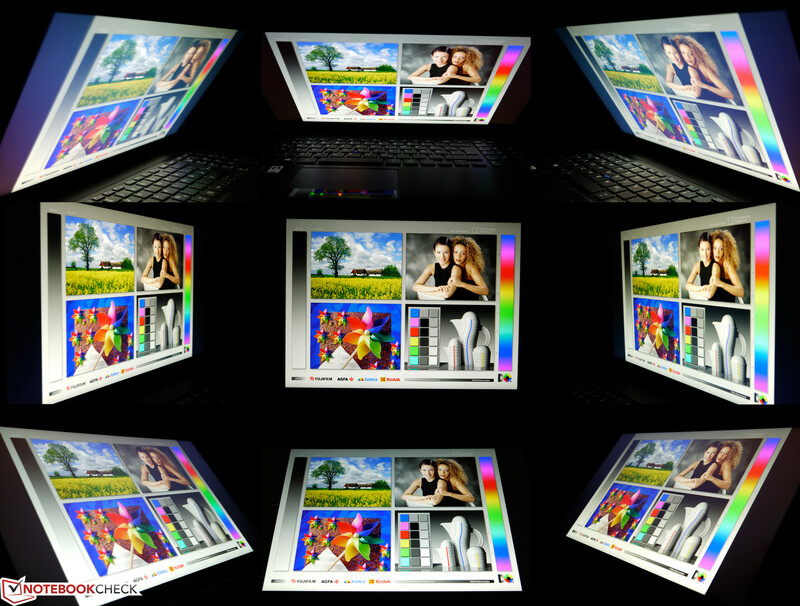 The resolution of the panel is 1920x1080 pixels (Full HD) with a pixel density of 141 ppi. This results in a relatively large desktop surface with sufficiently large fonts and symbols. 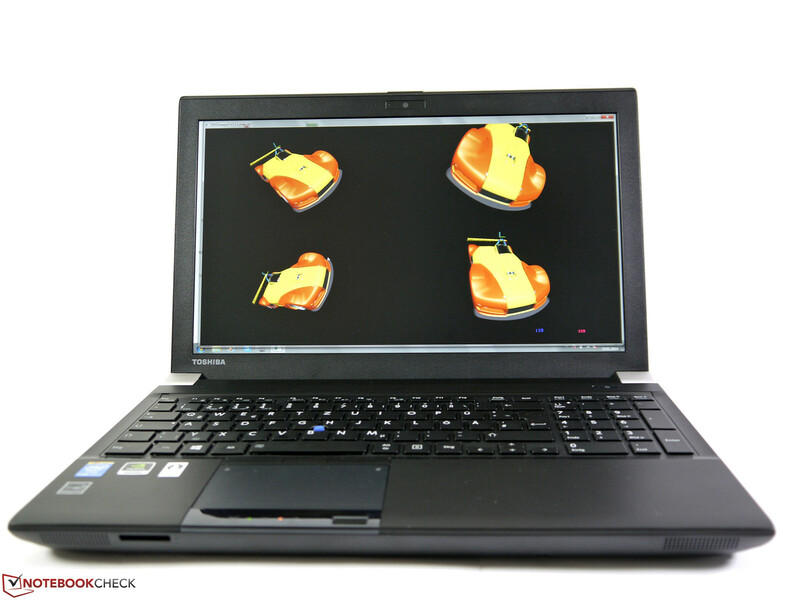 The display works well with a mobile workstation and underlines the professional orientation of the Tecra series. 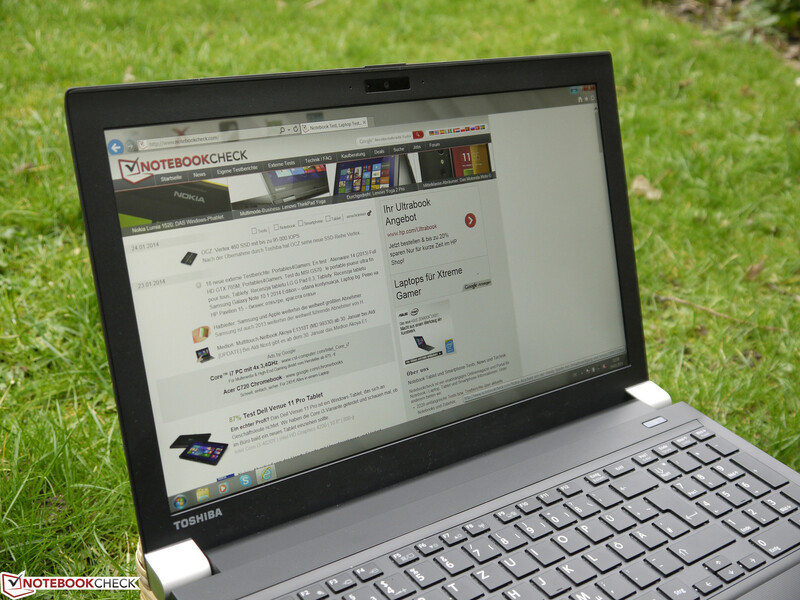 We could not find any other display options for the Toshiba Tecra W50. Toshiba advertises the panel as a high-brightness display and creates hope that we can use the device outdoors without restrictions. We measured an average maximum brightness of 260 cd/m², which is good, but not as overwhelming as the advertisement suggests. 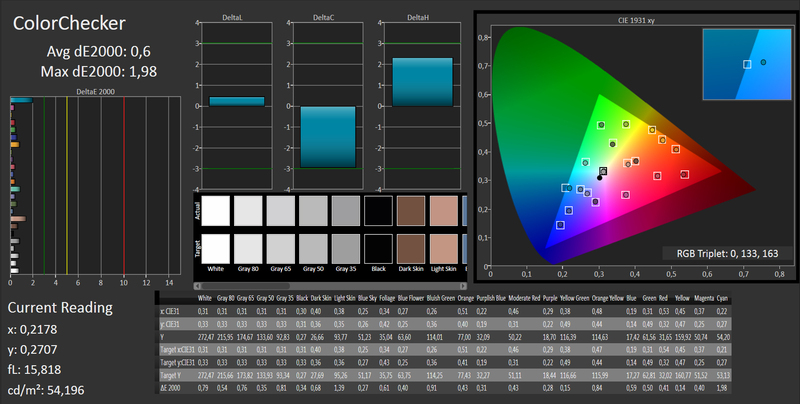 The brightness distribution is 82%; you can recognize brightness differences with plain contents, but that does not really have an impact on the practical use. 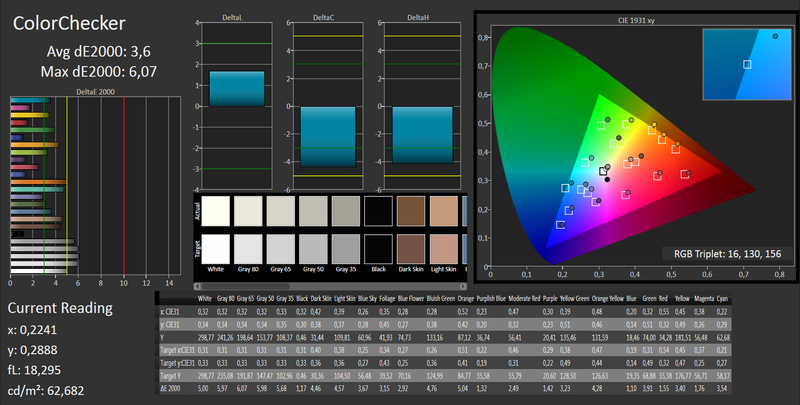 You can adjust the brightness in 10 steps starting from a minimum of 18 cd/m² all the way up to the maximum value. We measured 163 cd/m² in setting 6, which is also our setting for the battery runtime tests. The brightness is not reduced on battery power, so you can use the full luminance outdoors. Thanks to the anti-reflective display surface, you can still comfortably work with the maximum brightness depending on the display orientation. Very bright summer days or direct sunlight, however should be too much for the display and it will get harder to recognize the display content. The measured contrast ratio is 1,035:1 and results in rich blacks. This creates a certain wow effect when you watch movies or look at pictures. Dark passages appear much more authentic and have no problems with a grayish presentation. But assemblies, objects and fonts also benefit from the better differentiation. 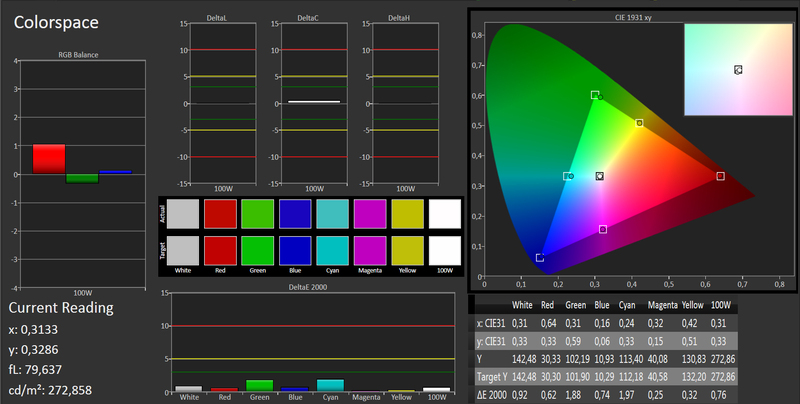 The available color spectrum does clearly surpass standard displays, but it still cannot completely cover the sRGB color space. A big part of the available colors is not within the sRGB standard. Magenta, blue and green are too pale while red and orange are oversaturated. 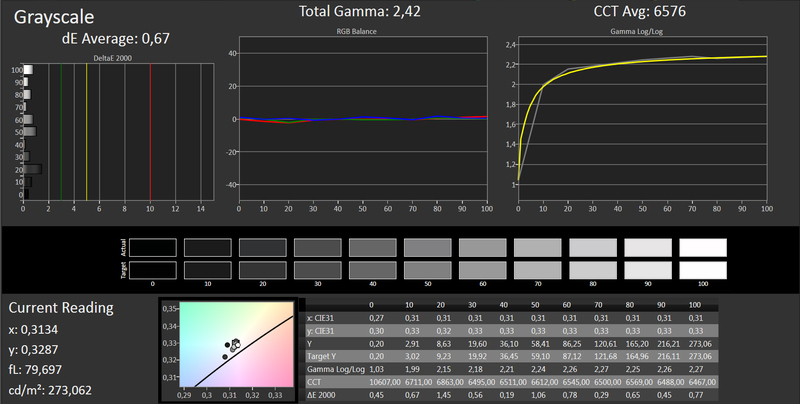 We determined an sRGB coverage of 88% and an AdobeRGB coverage of 63%. It is always suspicious when manufacturers make unusual promises so alleged features should be checked very carefully. This does not apply for the pre-calibrated display. 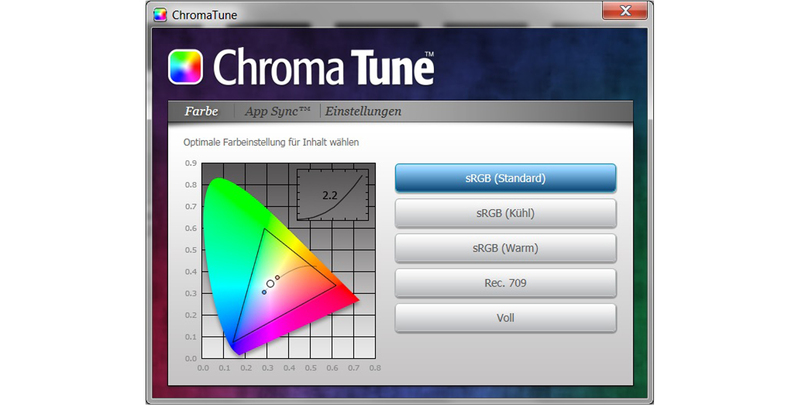 The color accuracy is very good out of the box (compared to the sRGB color space) and you can select predefined color settings with Toshiba's Chromatune tool. 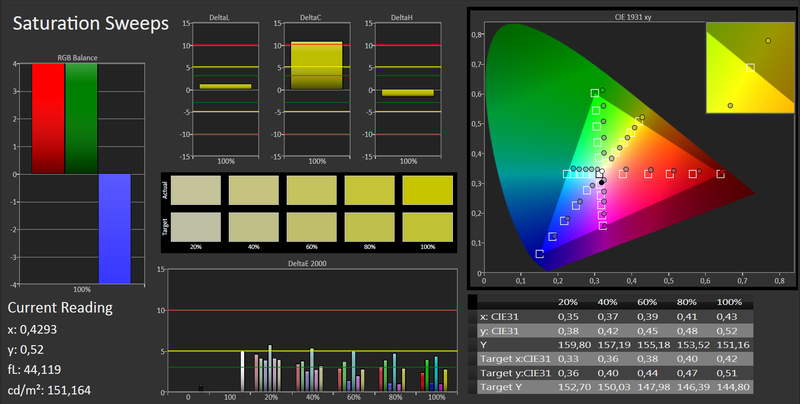 We checked the situation ex-works (full color space) and sRGB normal. 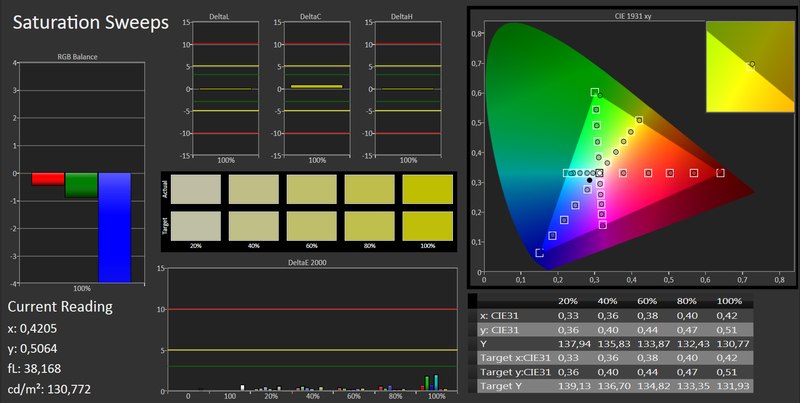 DeltaE2000 values (sRGB normal) under 4 mean that you cannot see any color differences. RGB balance, grayscale presentations and the gamma curve are usable as well. 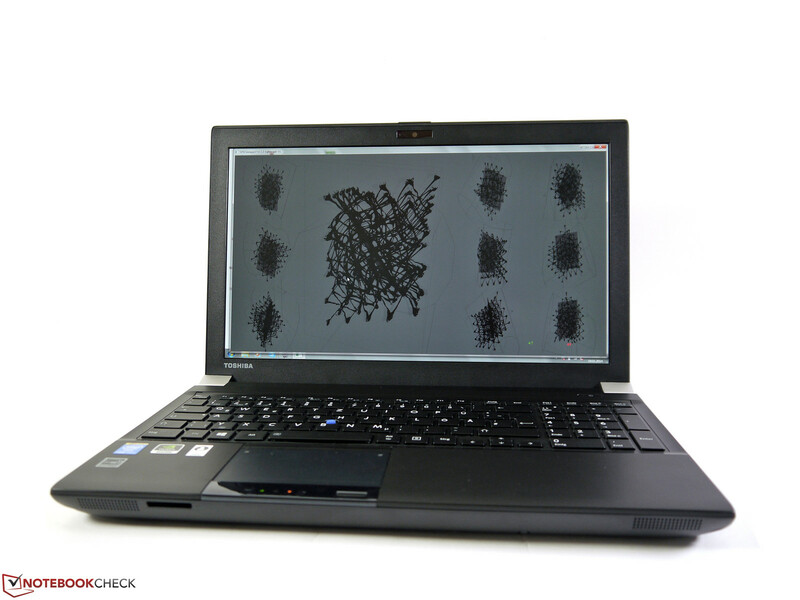 The viewing angle stability is very good and the picture remains visible from all sides. Colors, brightness and contrast only slightly change depending on the direction. We did not notice a glitter effect, which is visible in some IPS displays. 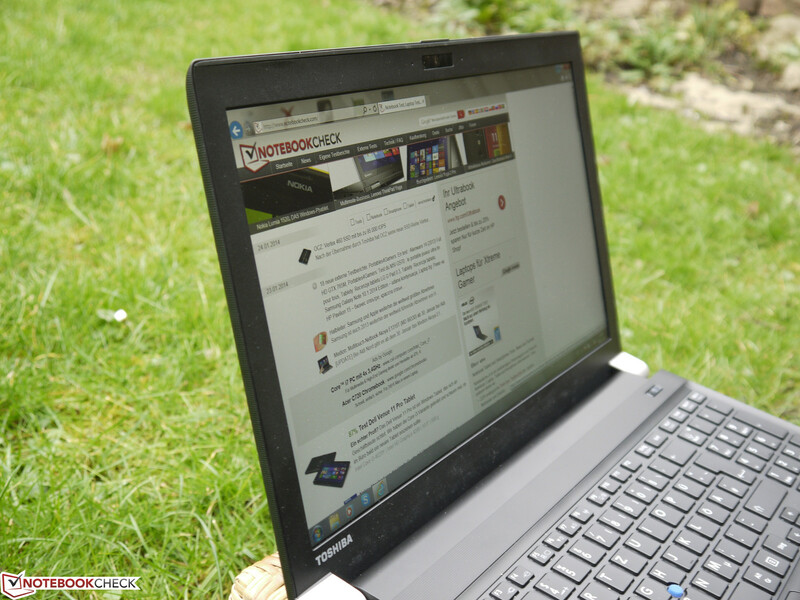 Toshiba's Tecra W50 is currently only available in the reviewed A-104 version. We could not determine if other configurations are planned. However, the offered hardware configuration is sophisticated and it is a good basis for many applications. Especially impressive is the maximum memory configuration of 32 GB. 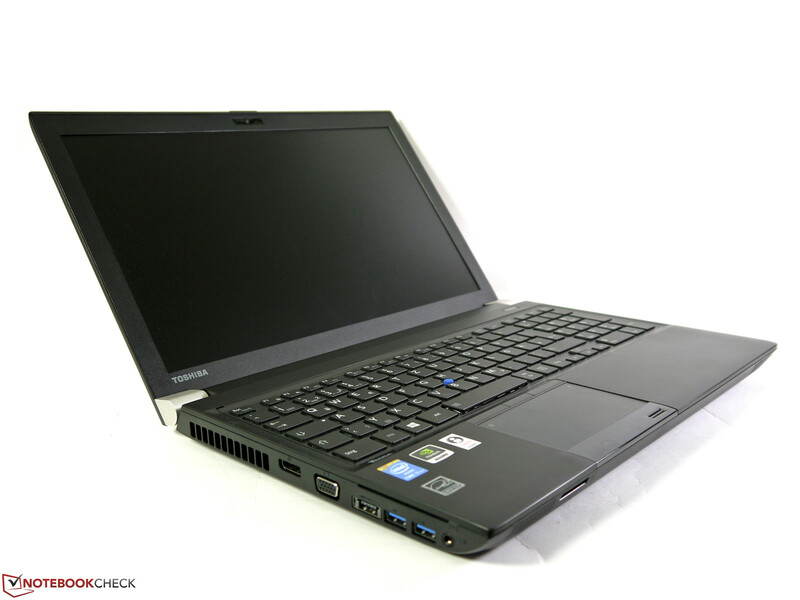 The processor is Intel's Core i7-4800MQ and graphics are handled by the Nvidia Quadro K2100M. Only the hybrid hard drive does not really meet the high-end requirements. 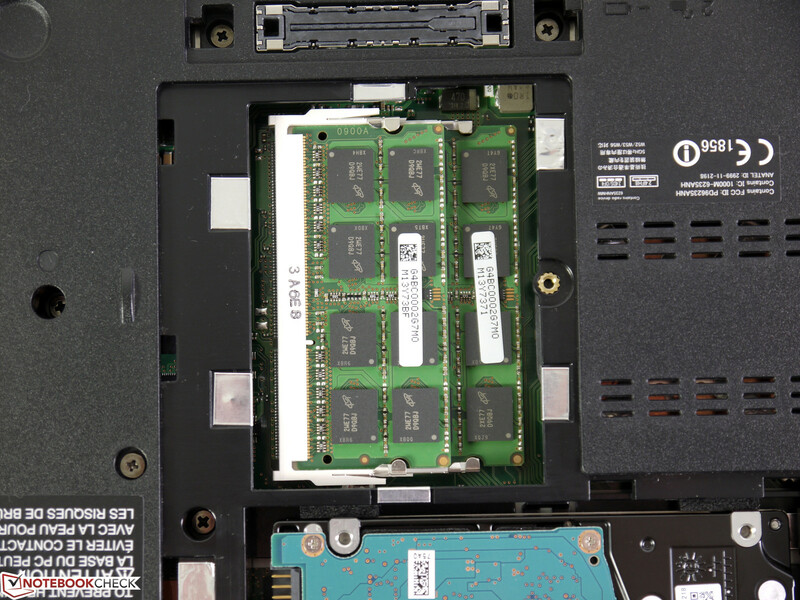 A bigger cache module or a real Solid State Drive would have been a better solution for the review unit. 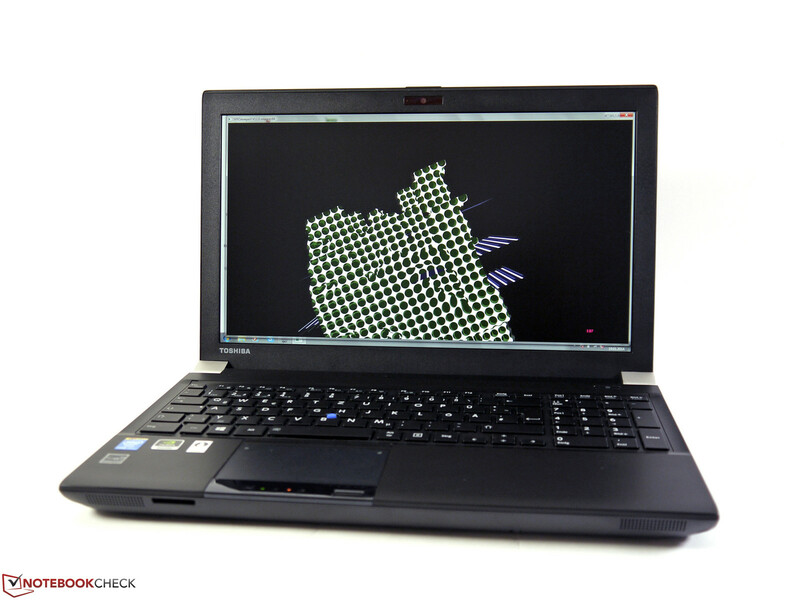 Intel's Core i7-4800MQ-CPU is a popular choice for powerful notebooks and is currently in sixth place in our comprehensive CPU benchmark list (only notebook CPUs). The processor will therefore not be a bottleneck in the near future and nearly every task should be executed very quickly. Applications that support multiple cores also benefit from the four native cores and Intel's Hyperthreading technology, so eight threads can be executed simultaneously. Cinebench R11.5 (Multi) achieves a very good 7.31 points. 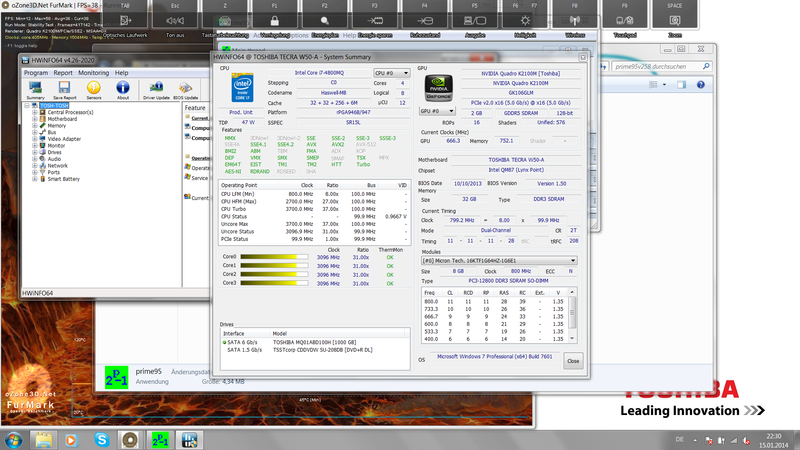 The processor can raise its clock up to 3.7 GHz (1 core), which leads to 1.64 points in Cinebench R11.5 (Single). 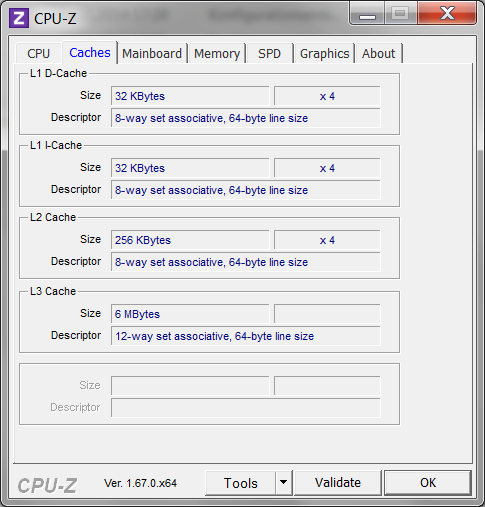 The multi-core performance is therefore 4.5 times higher. iTunes is one of the applications that is not optimized for multiple cores; audio conversion from MP3 to AAC resulted in 56.9 times the normal speed. Not many alternatives have been faster in this test yet. The stress test, which is simulated by around 2 hours of Prime95 and FurMark, did not indicate any problems. 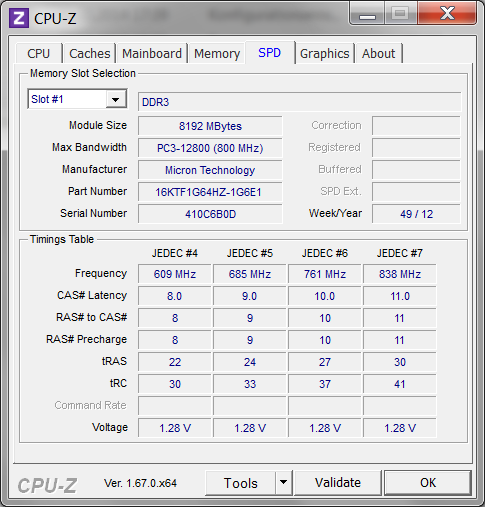 The processor managed to maintain a clock of 3,100 MHz. You will however have to live with a performance deficit of around 50% on battery power. 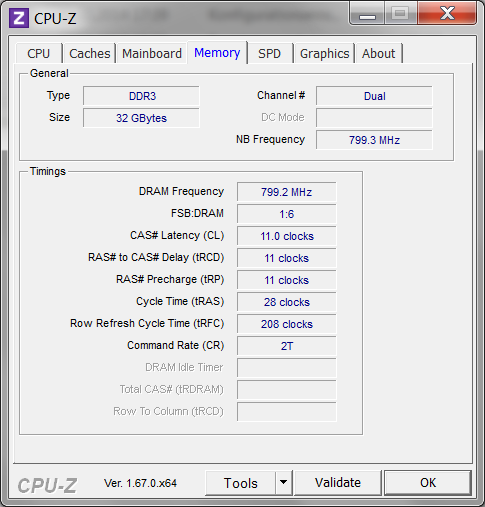 The Cinebench R11.5 (64-bit) result, for instance, dropped from 7.31 to 3.72 points. The system performance suffers from the comparatively slow storage solution. The performance is far behind Solid State Drives in our benchmarks, despite the 8 GB flash cache. It is also the bottleneck of the system and affects the performance of the other components. You will notice it in practice when you try to copy or transfer large amounts of data and the write performance of the drive drops. The SSD cache of the hybrid hard drive cannot really compensate the usually high access times of conventional hard drives when you launch applications or open files. Responsiveness, system boot (17 seconds) and the subjective performance impression are not perceptibly improved. PCMark 8 determines the following results for our system: Home 4,420 points, Creative 3,397 points and Work 4,616 points. 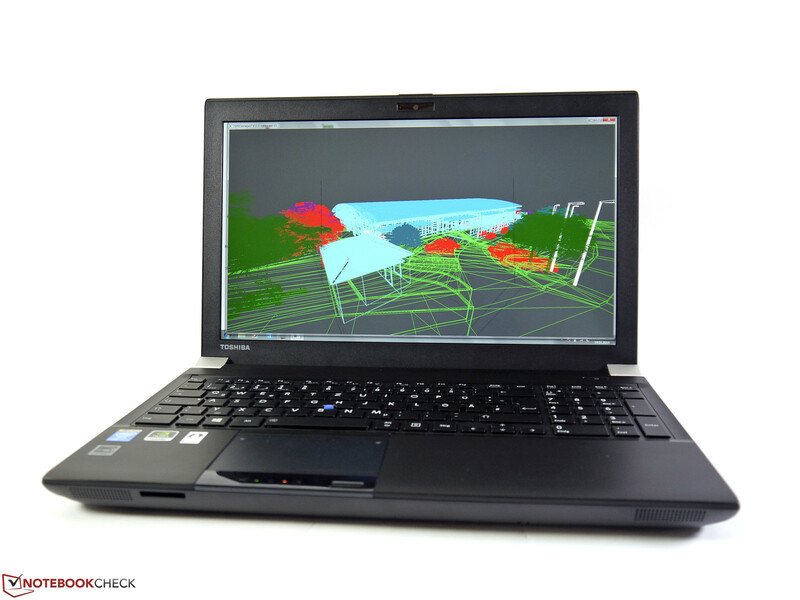 The performance of the workstation is sufficient for almost any task, only larger CAD projects or other very complex 3D applications could be too demanding for the Nvidia Quadro K2100M. 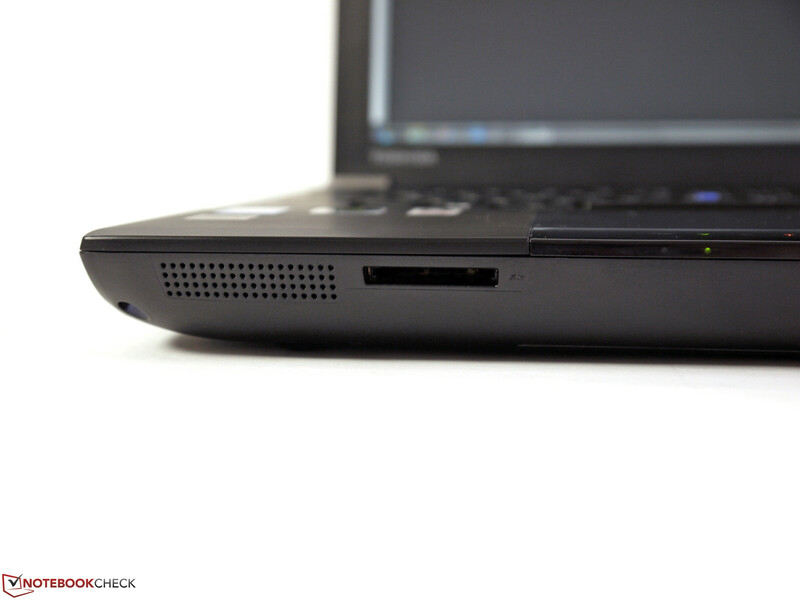 Toshiba equips the Tecra W50-A-104 with its own Toshiba hybrid hard drive with an 8 GB SSD cache. The responsive cache is supposed to improve the boot times and the handling with frequently used applications and files in practice, but we cannot determine an effect when we use the review unit. 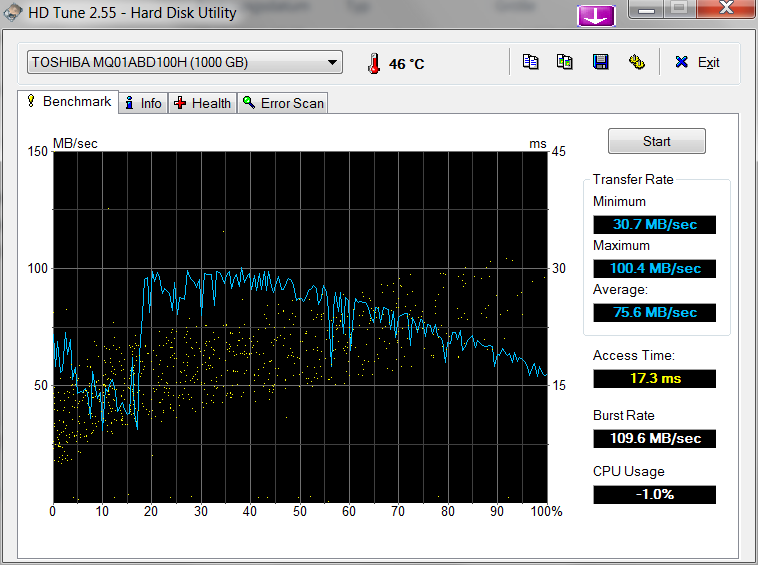 An average transfer rate of 72 MB/s (reading) is comparable with hard drive-only systems at best. At least you get a gross capacity of 1,000 GB for applications and data. We still recommend replacing the hard drive with a Solid State Drive to improve the performance. Transfer rates of up to 600 MB/s and low access times of such a drive result in a significant performance improvement. 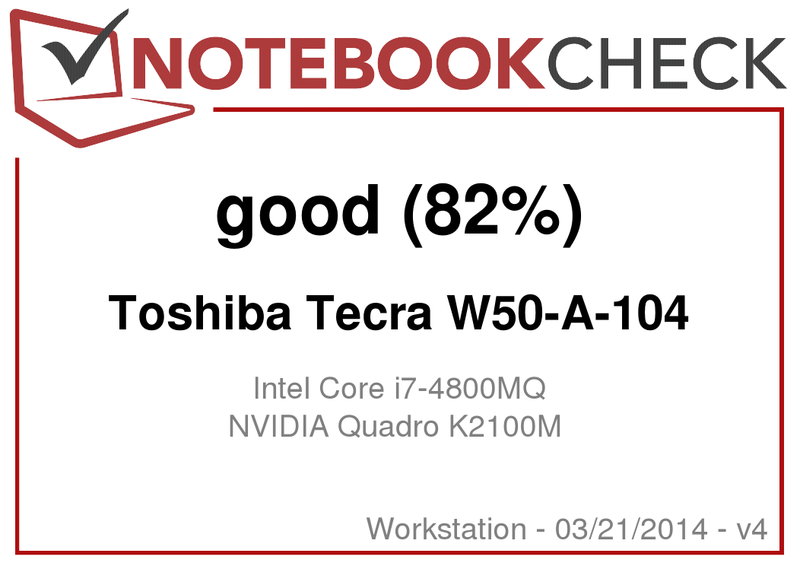 Contrary to a statement on Toshiba's product page (at least for a short time), Toshiba's Tecra W50 workstation does not support Nvidia's Optimus technology. That means you can neither use the HD Graphics 4600 of the Intel processor nor Intel's Quick Sync video engine. The professional Nvidia Quadro K2100M has to do all the work, starting from simple text editing up to complex 3D rendering. Nvidia's Quadro K2100M is a professional graphics card that should have a significant performance advantage over normal consumer solutions in professional applications because of the OpenCL optimizations. 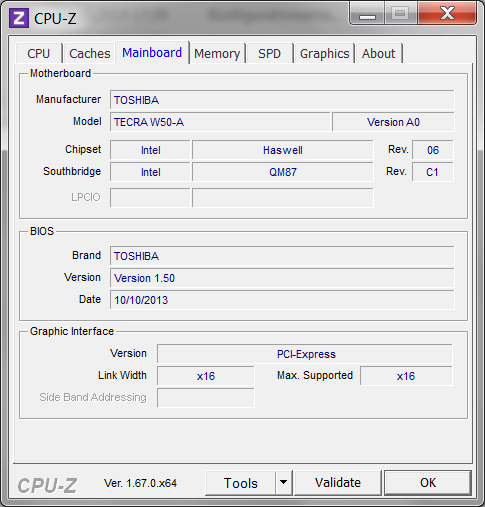 In addition, a special BIOS and special drivers are supposed to improve the stability. The Nvidia Quadro K2100M replaces the predecessor Nvidia Quadro K2000M and has 576 shader units, a core clock of up to 667 MHz and 2 GB GDDR5 video memory with a 128-bit memory interface. 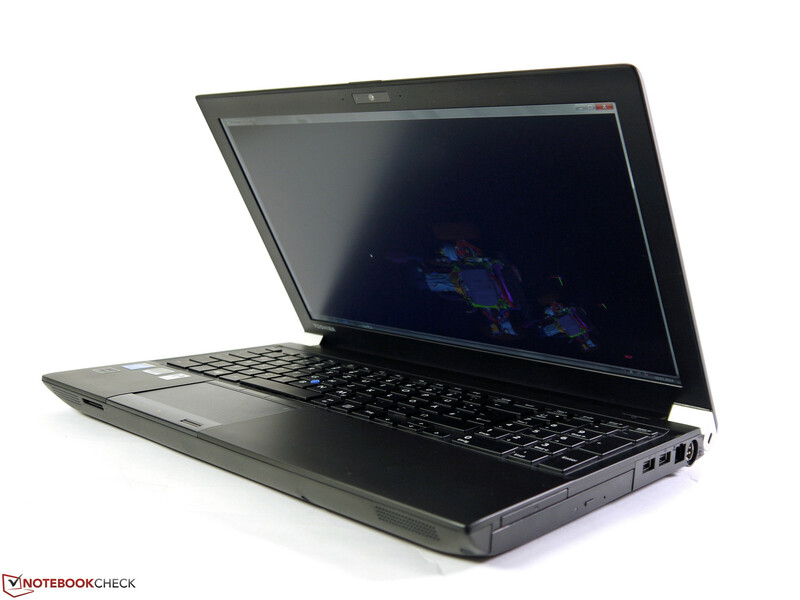 The performance can be compared with a consumer Nvidia GeForce GT 750M. 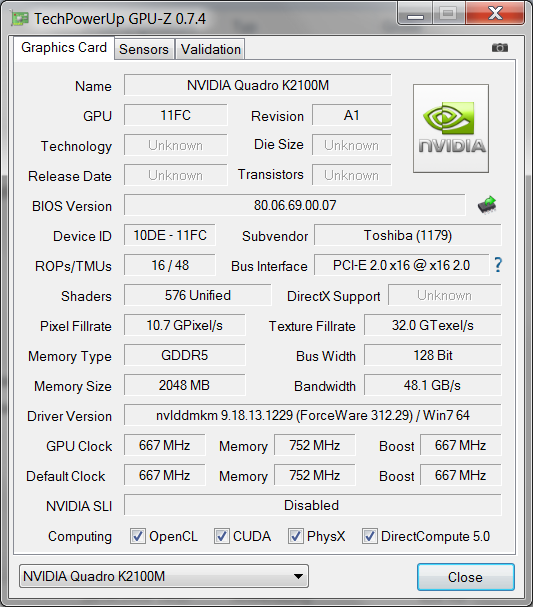 The Nvidia Quadro K2100M has a real advantage if professional CAD applications use the OpenCL interface with its optimizations. The performance differences can be significant, depending on the professional software. This means you should know what applications you are going to use before you buy the workstation. 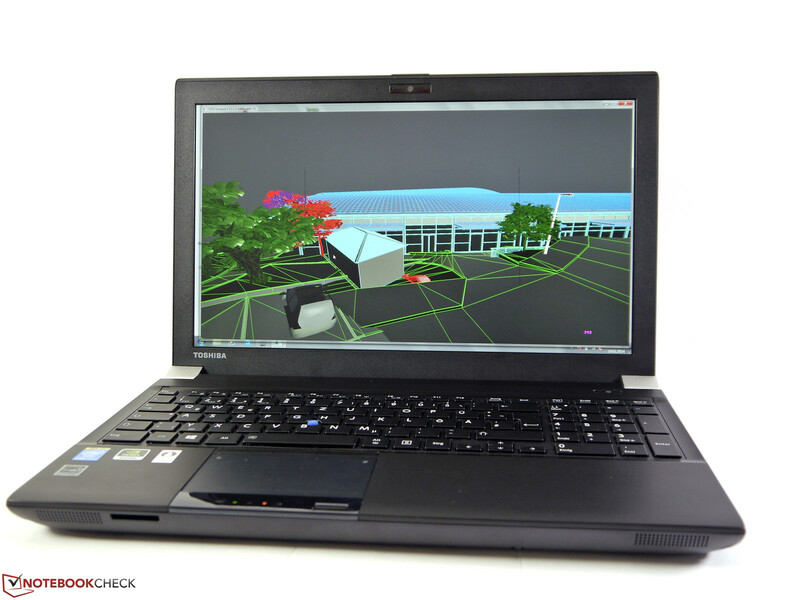 We test the performance of professional GPUs with the SPECviewperf 11 benchmark in combination with a selection of CAD software. The Nvidia Quadro K2100M can clearly beat its predecessor Quadro K2000M in all tests, but the situation is different when we compare the K2100M with the AMD FirePro M4000 from last year. The Nvidia GPU has problems in Lightwave, Maya as well as Solidworks and can only keep up with the AMD at best. The performance advantage of the Nvidia chip in TCVIS, Pro/Engineer, Ensight and Catia on the other hand is impressive. Powerful consumer GPUs without the associated optimizations have no chance in these scenarios. 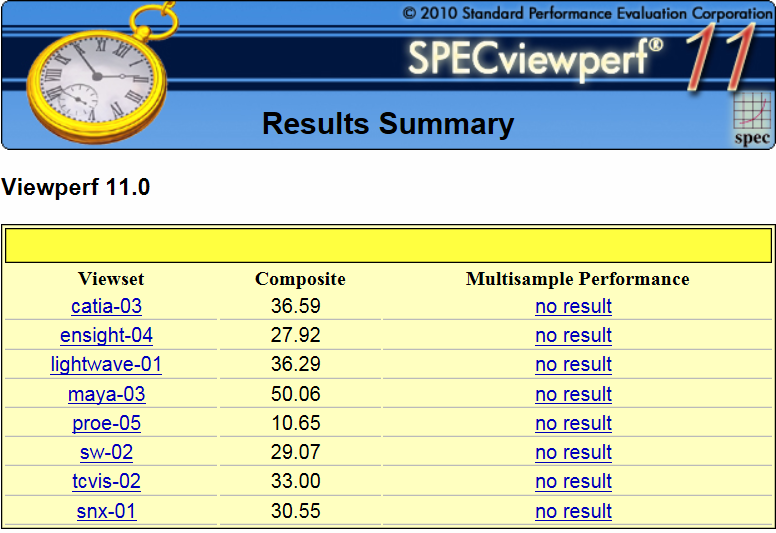 SPECviewperf 12 is available since the end of last year, but we do not have many comparison results and will have to wait for a few more reviews to give a meaningful evaluation. The performance on battery power is reduced by up to 50%, depending on the scenario. For example, Lightwave only managed 36 fps and Pro/Engineer only 10 fps. 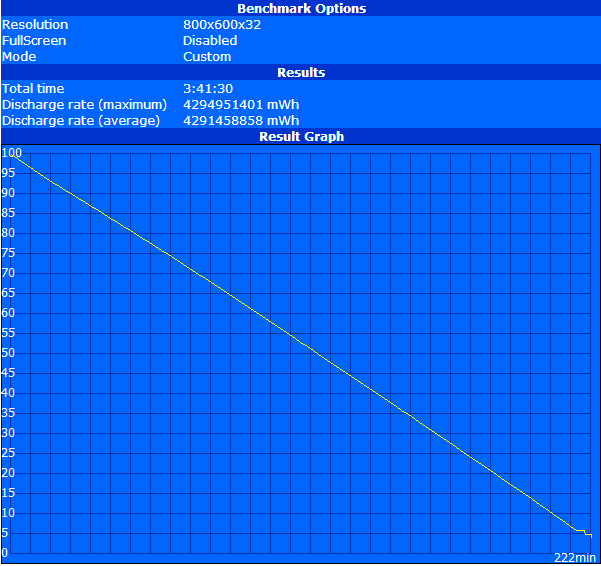 Raw performance is important for applications that use the DirectX interface instead of OpenGL. We already mentioned that the Nvidia Quadro K2100M is comparable with the Nvidia GeForce GT 750M and cannot benefit from the OpenGL optimizations. 3DMark 11 delivers 2,659 points and Heaven 3.0 (DX11) runs with 32.6 fps on average. DirectX is also used by professional applications like AutoCAD 2013 or AutoDesk Inventor. Additional scenarios for GPUs are GPGPU tasks. Calculations are transferred to the graphics chip to take advantage of the higher performance and reduce the CPU load at the same time. Available interfaces of our review unit are Nvidia's CUDA or OpenCL. We already determined in many reviews that Nvidia GPUs cannot quite keep up with Intel's HD Graphics or AMD GPUs in this regard. We performed some tests in the areas of cryptography, financial analysis, picture editing and video conversion to evaluate the performance in these scenarios. The screenshots below show a comparison with the competitors that we already reviewed. The gaming performance is usually sufficient for medium to high details. 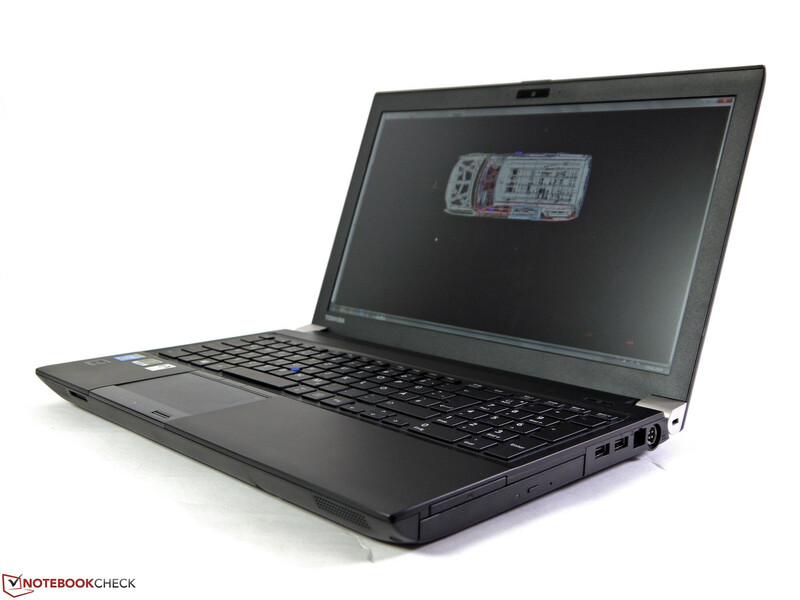 We performed further gaming benchmarks of the Nvidia Quadro K2100M in our review of the Dell Precision M4800. We can measure a system noise of 31.6 dB(A) with light workloads during idle. It drops to a minimum value of 30.1 dB(A) as soon as the hard drive is deactivated and the noise from the motor is gone. This should also be the system noise in combination with a Solid State Drive. The fan is just slightly audible in this scenario. 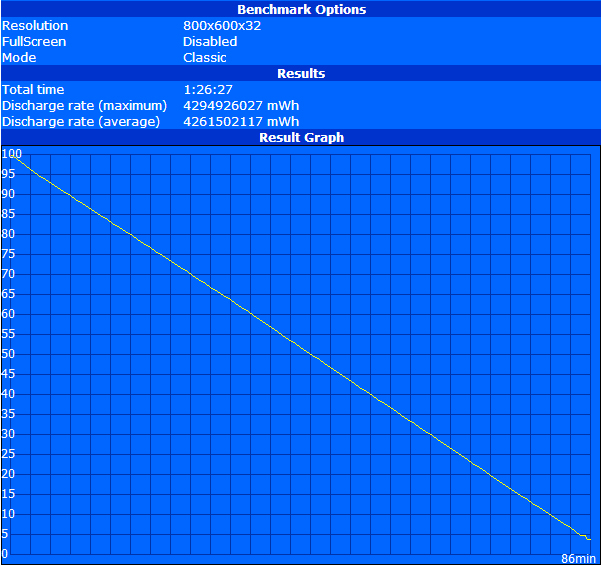 The Eco utility has no impact on the fan and we could not find any BIOS setting to adjust the fan control, either. The fan only spins up after around 5 minutes with medium workloads, and the 39.2 dB(A) are tolerable for longer periods. 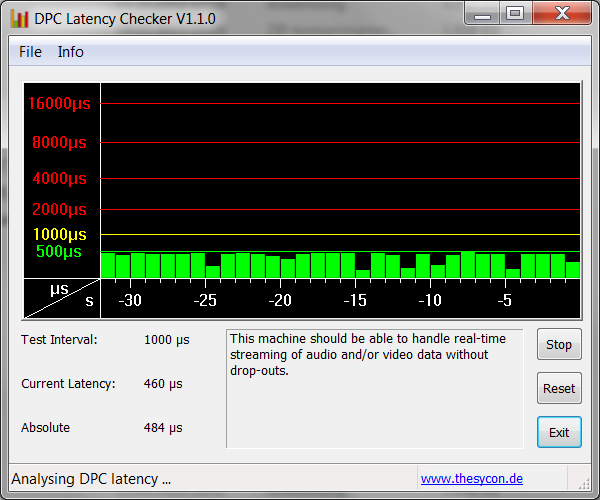 It only gets annoying under maximum load with 44.6 dB(A). 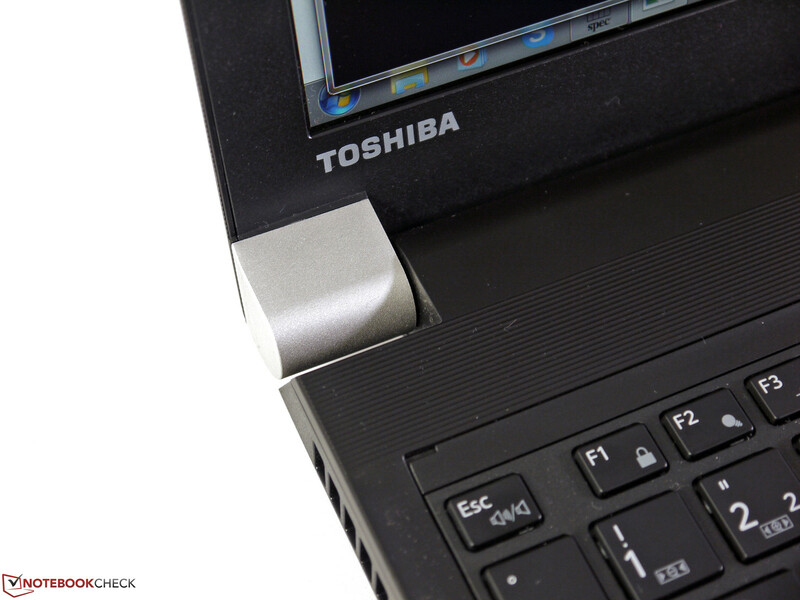 Temperatures of the Toshiba workstation are never in a critical area. Quite the contrary actually: The fan does noticeably spin up under maximum load, but leads to even cooler case temperatures compared to the energy-saving mode with light workloads. After one hour of Prime95 and FurMark we measured the maximum value of 42.1 °C (107.8 °F) at the left keyboard frame, all other areas are much cooler. Only the fan exhaust should be avoided, 66.7 °C (152.1 °F) are uncomfortably hot. The fan is slower with light workloads and leads to higher case temperatures in favor of a quieter system noise, but a maximum temperature of 43.9 °C (111.0 °F) is still far away from the critical area. The sound quality is comparable to many rivals and disappoints with a treble-focused characteristic. Bass and mids are almost non-existent. The maximum volume is also comparatively limited and is only sufficient for presentations in small groups. We recommend an external solution for nearly all scenarios. You can achieve a significant improvement with comparatively small additional costs and you can use USB, Bluetooth, the 3.5 mm stereo jack or WLAN. 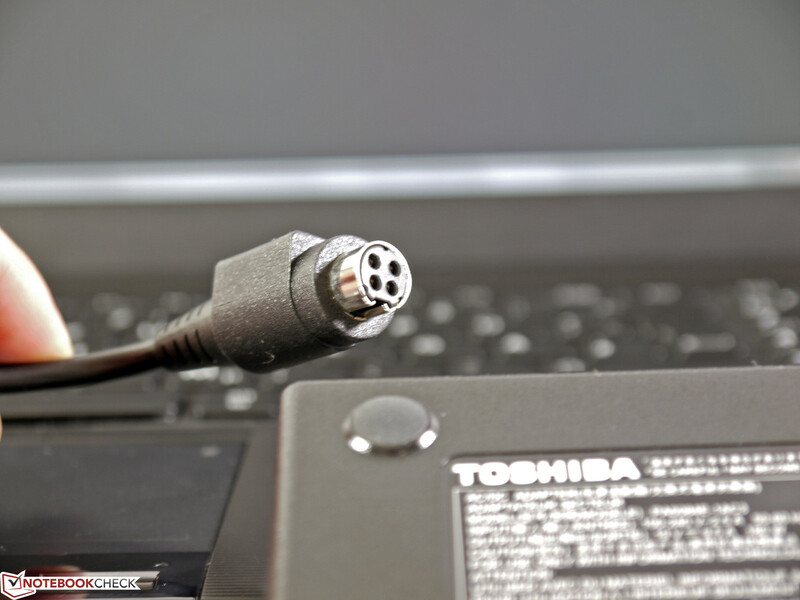 You only have to be careful with headsets; Toshiba only uses a combined stereo jack for the Tecra. Toshiba did a good job in regard to the energy consumption, even though the CPU is a standard voltage model with a TDP of 47 Watts and you have to use the dedicated Quadro GPU all the time. 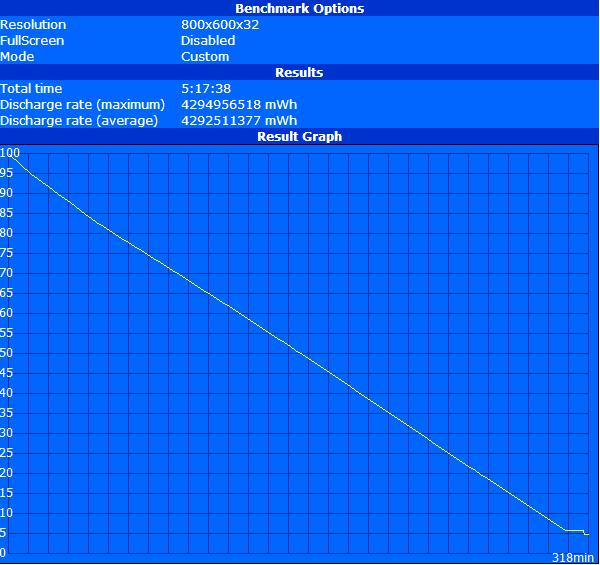 The minimum consumption of 9.7 Watts even beats the Dell Precision M3800 by 1.6 Watts. The other values during idle are also convincing with 13.7 Watts (maximum display brightness, balanced energy profile, flight mode) and 15.8 Watts (maximum display brightness, high-performance profile, wireless connections activated). We measured up to 79.9 Watts for medium workloads that leveled off at around 75.9 Watts after a short while because the maximum clocks are not maintained. We can observe a similar behavior under maximum load, where the starting consumption of 122.7 Watts drops to 108.9 Watts. 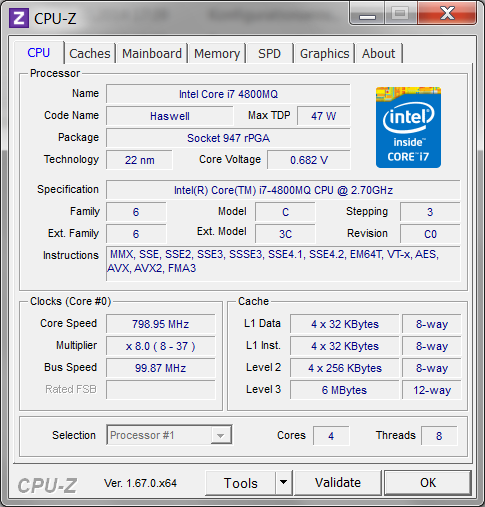 The CPU clock fluctuates between 3.4 and 2.7 GHz at first before it levels off at 3.1 GHz, which can be maintained for the rest of the test. 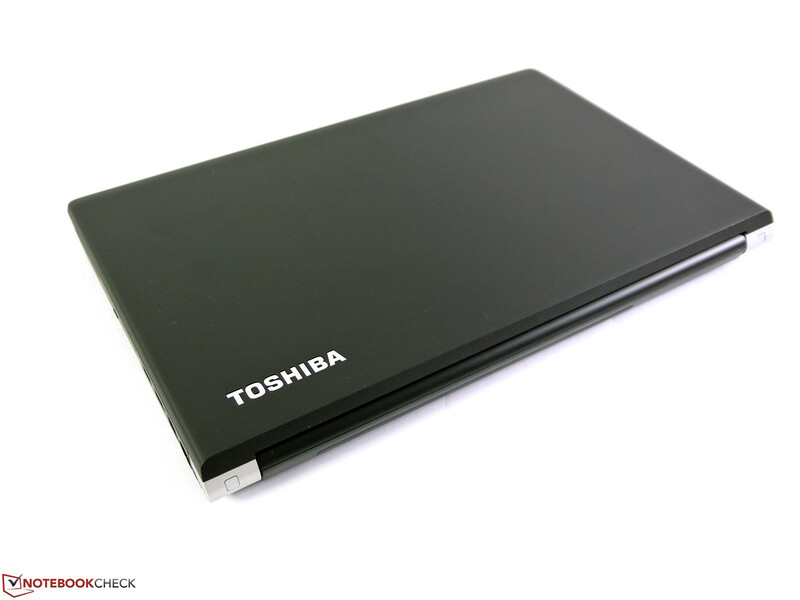 Toshiba equips the Tecra W50 with a standard battery and a capacity of 67 Wh. 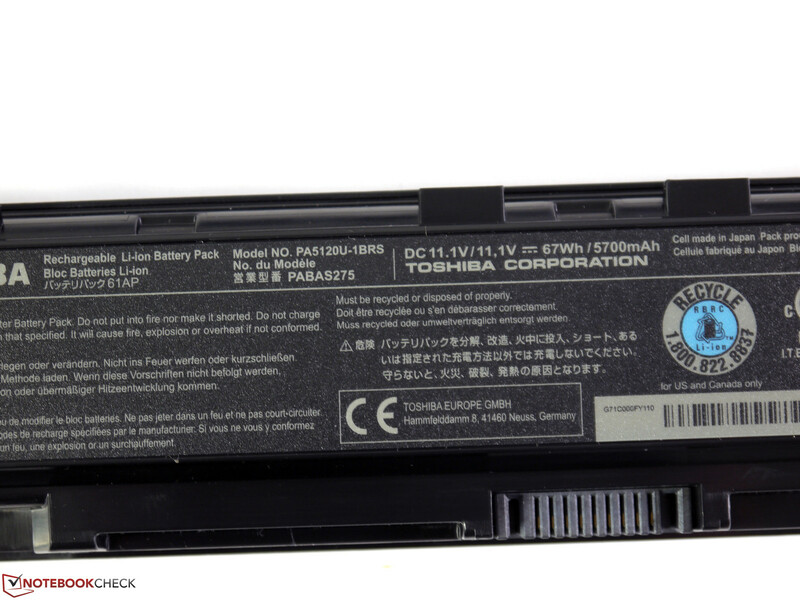 Toshiba also offers a smaller 48 Wh battery (PA5109U-1BRS, around 150 Euros; ~$205) for the very similar Toshiba Tecra A50, but we could not find a model with a higher capacity. The battery runtimes are reasonable. 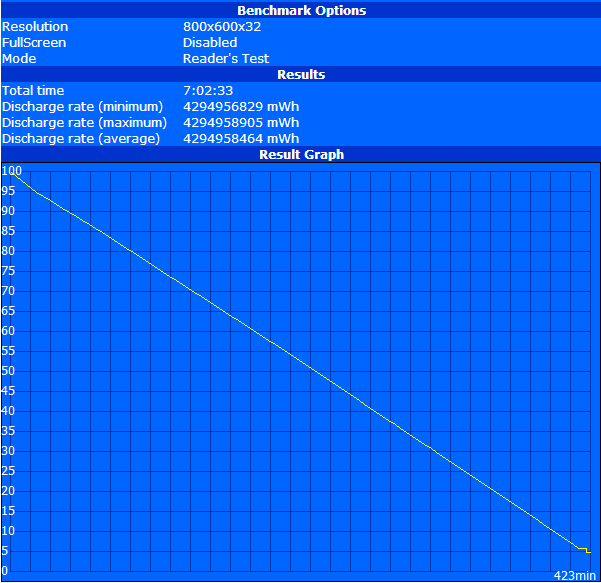 Battery Eater Reader's Test determines a runtime of more than 7 hours. The display is quite dark in this scenario with 18 cd/m² and the test simulates reading of a document without wireless connections. The review unit manages a good runtime of 5:18 hours with an adjusted display brightness at 163 cd/m² (6/10), activated wireless modules and a script that simulates web browsing. Playback of a Full HD movie from the hard drive (163 cd/m², wireless off, energy-saving profile) is more demanding and results in 3:42 hours. Maximum load (Battery Eater Classic Test, maximum display brightness, everything activated, high-performance profile) benefits from the reduced performance on battery power and results in a flattering runtime of 1:26 hours. 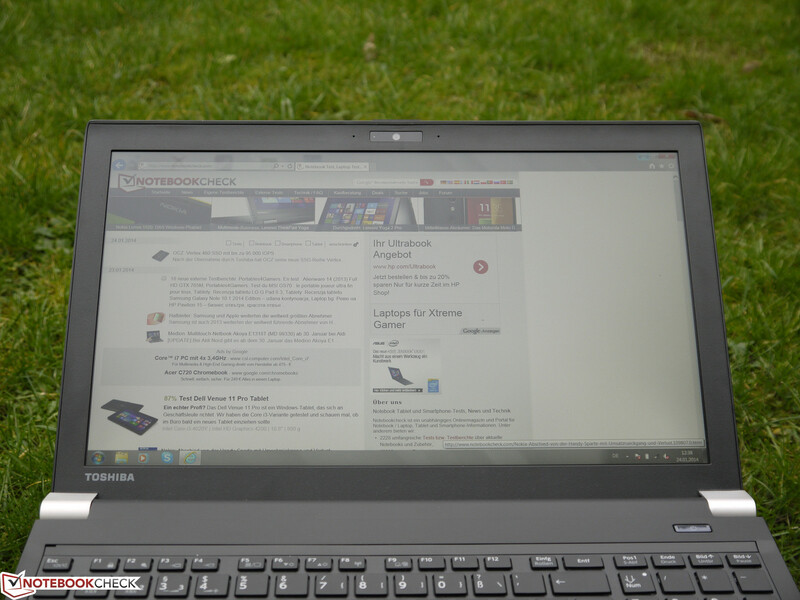 Toshiba's first mobile workstation is a success. 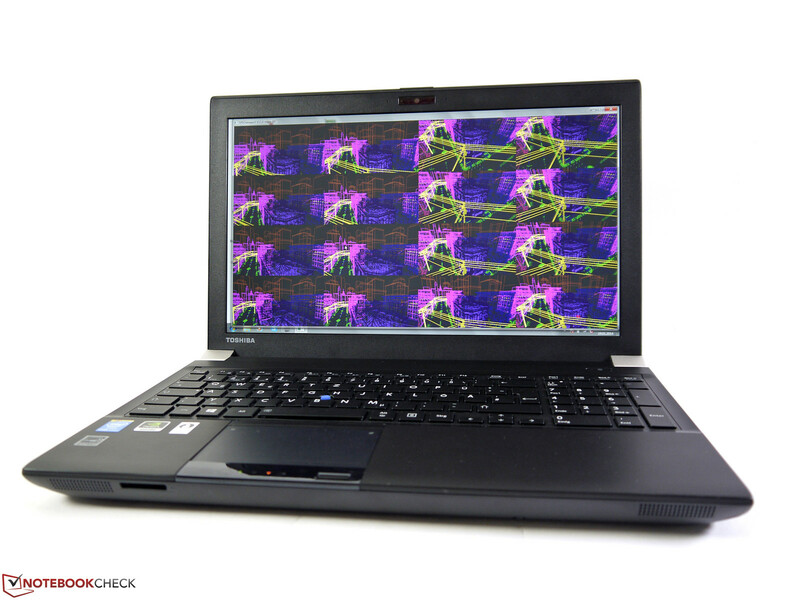 The Tecra W50-A-104 offers a good level of performance, good input devices, an excellent display and appropriate features. Basic characteristics like a mostly sturdy chassis, good expandability and reasonable battery runtimes are not ignored. However, there are also some compromises when you have a closer look. The storage solution does offer a comparatively high capacity, but it is very slow in return and does affect the overall system performance. We would have preferred a better solution, especially when you consider the high price. 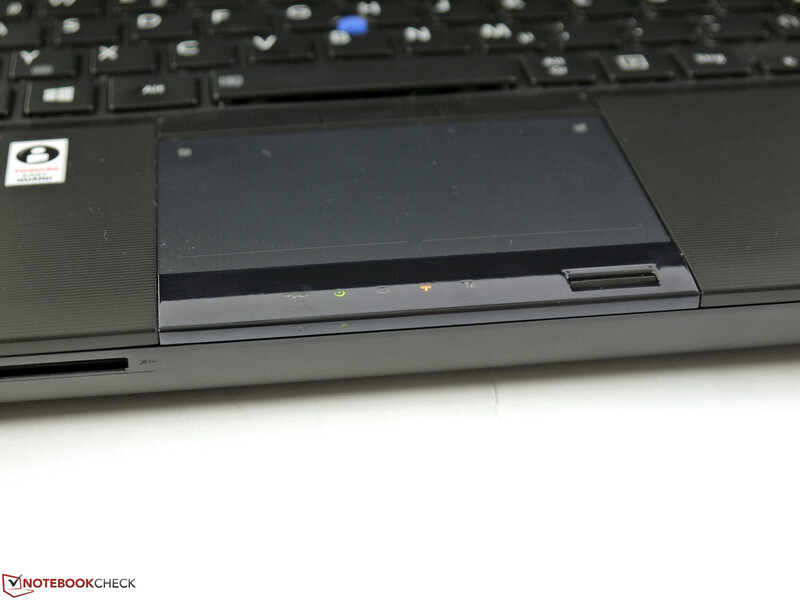 While the flexible chassis parts might not be a problem in many cases, the unfavorably positioned status bar with the integrated fingerprint reader might. 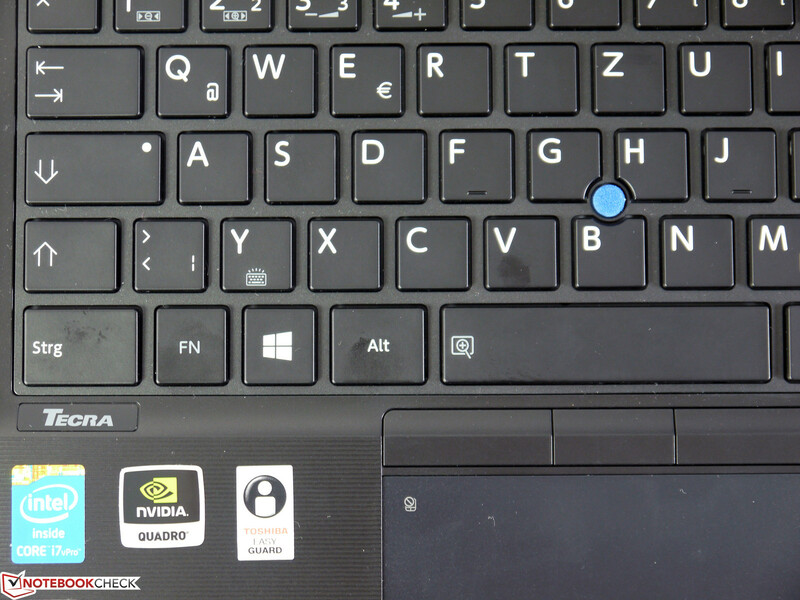 The small space bar can also be annoying and is not really a sophisticated solution. 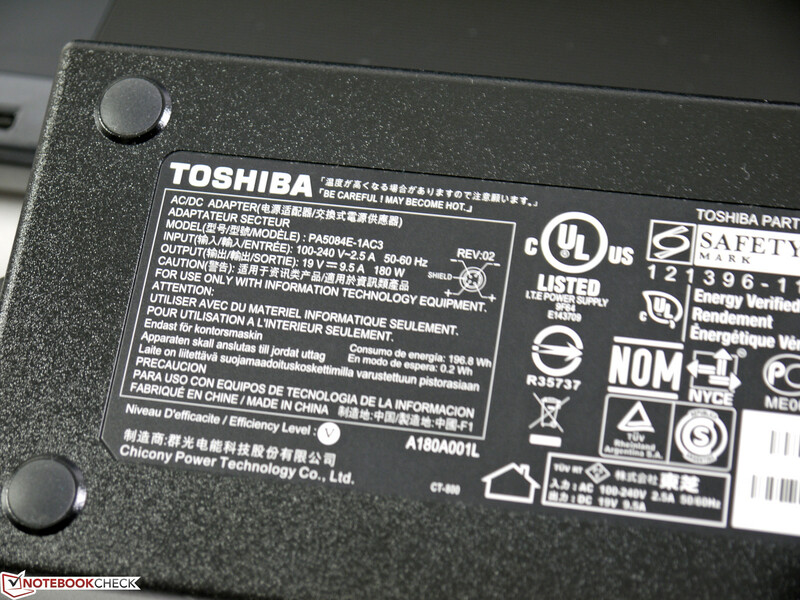 We are not sure that the short warranty period of one year really suits the target group and Toshiba's double warranty cannot really compensate that. 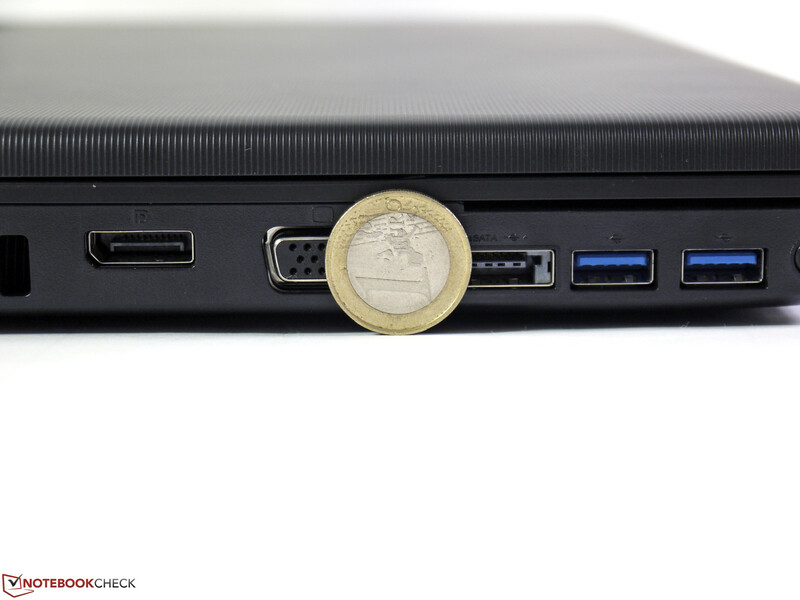 A warranty extension is at least fairly inexpensive and just slightly raises the high street price of around 2,500 Euros (~$3412) for our review configuration. ...and does convince in many areas right away. 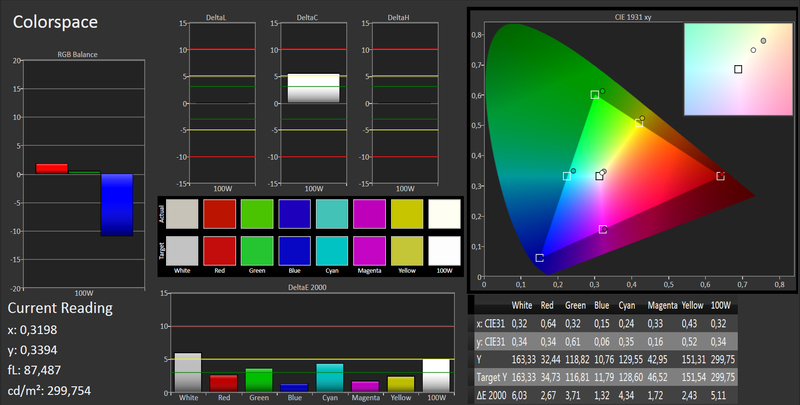 One highlight is the very good Full HD display. ...and offers very good viewing angles. The port variety is very good as well. Not many ports are missing. ...but could be improved in certain areas. ...but is unnecessarily slowed down by the hard drive. 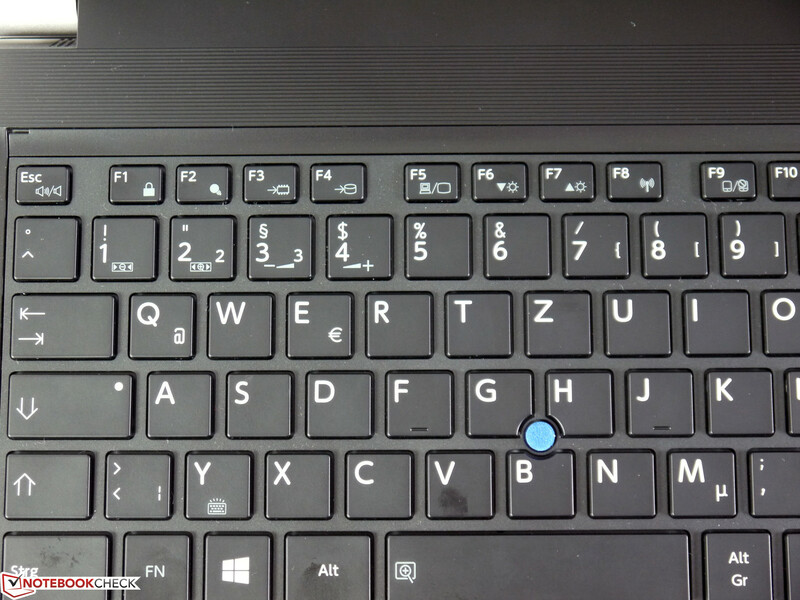 The keyboard is suited for frequent writers but it has a small space bar. ...and has a appropriate surface. 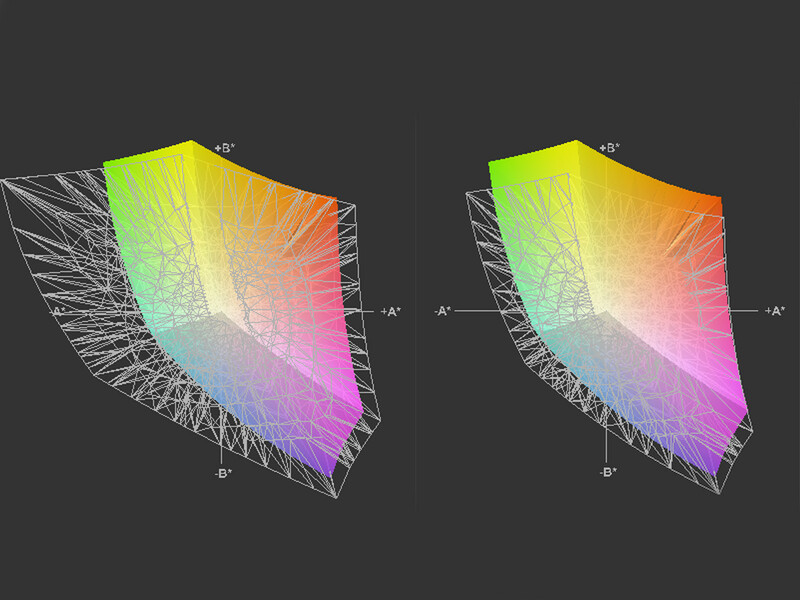 Dimensions meet the 15-inch standard. The LED status bar with the integrated fingerprint reader can be annoying. The card reader is easy to reach. The PSU weighs 1 kg and increases the overall weight noticeably. It has a generous nominal output of 180 Watts and does provide sufficient reserves. The power connector is much bigger compared to the Tecra A50. The display hinge could be firmer. Sophisticated port layout at the right side of the case. The power connector is far at the back. 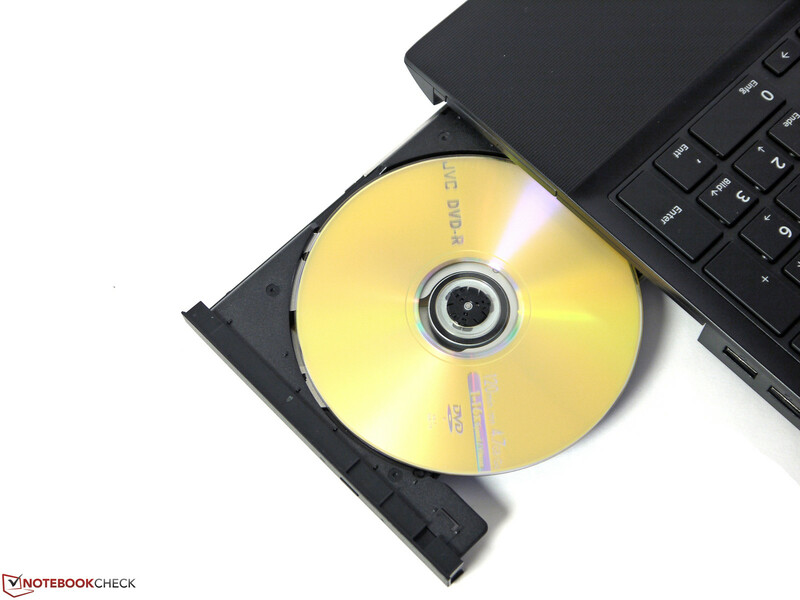 Optical drive with support for the standard DVDs and CDs. ...and are also far at the front. The fan exhaust is at the back in return. Digital and analog ports for external displays. The maximum opening angle of the display is limited. 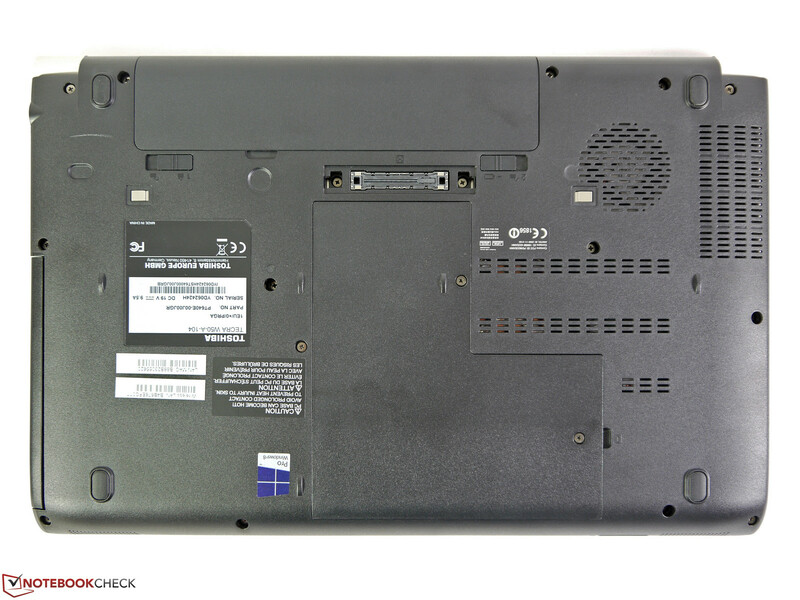 Dell's Precision M3800 is just as thick as the base unit of the Tecra W50. 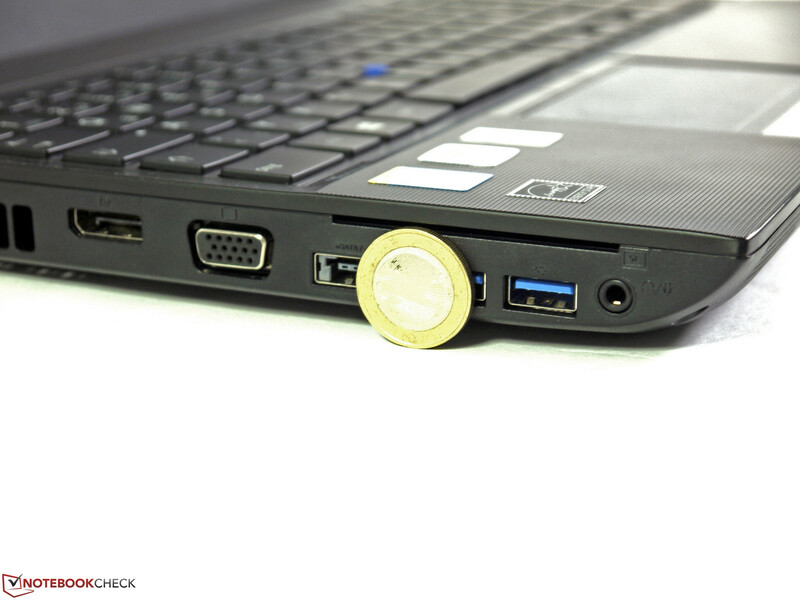 The eject button for the optical drive is easy to reach. ...and has a standard capacity of 67 Wh. 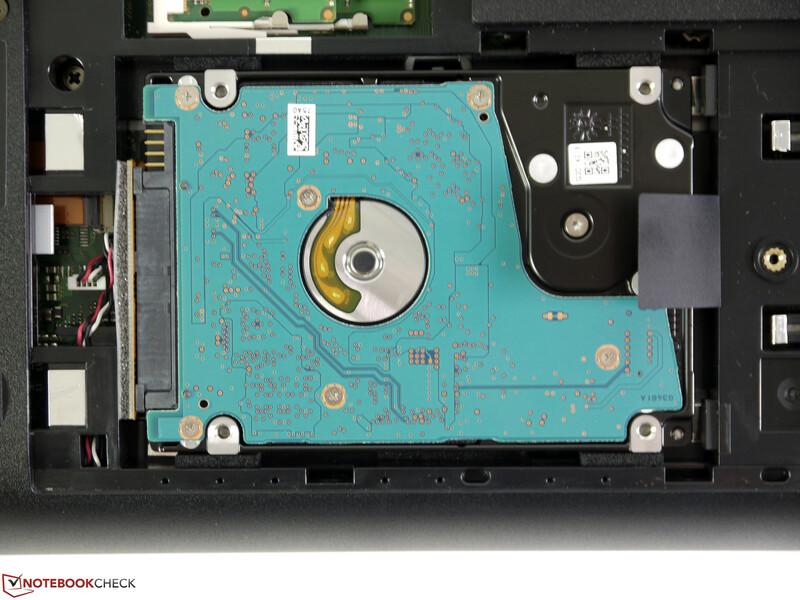 The hard drive is fixed without screws. It has a large capacity, but is also quite slow in return. The maximum amount of RAM (32 GB) is already integrated. Docking port for quick connection of stationary peripherals. 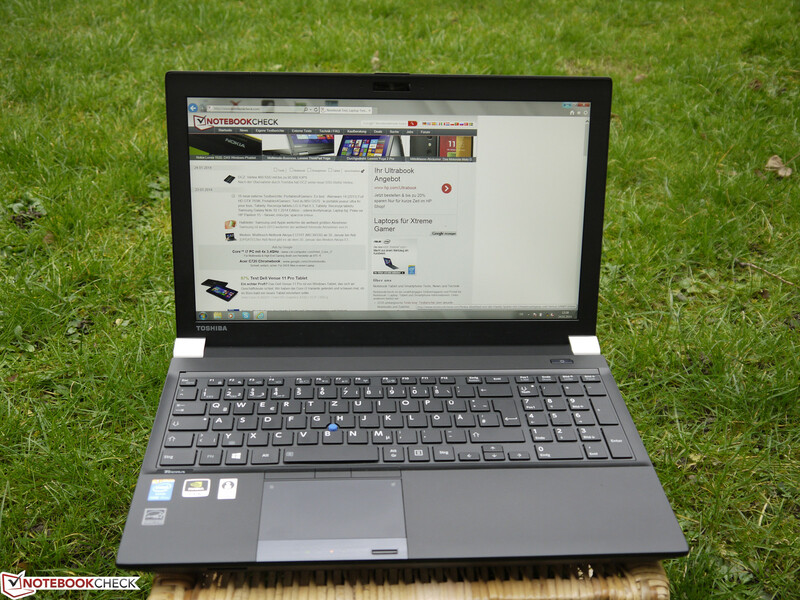 The great display, the comprehensive features and the good overall performance. A faster storage solution and small improvements to some details. We would also appreciate the availability of several configurations. That Toshiba managed to offer a competitive workstation right away. 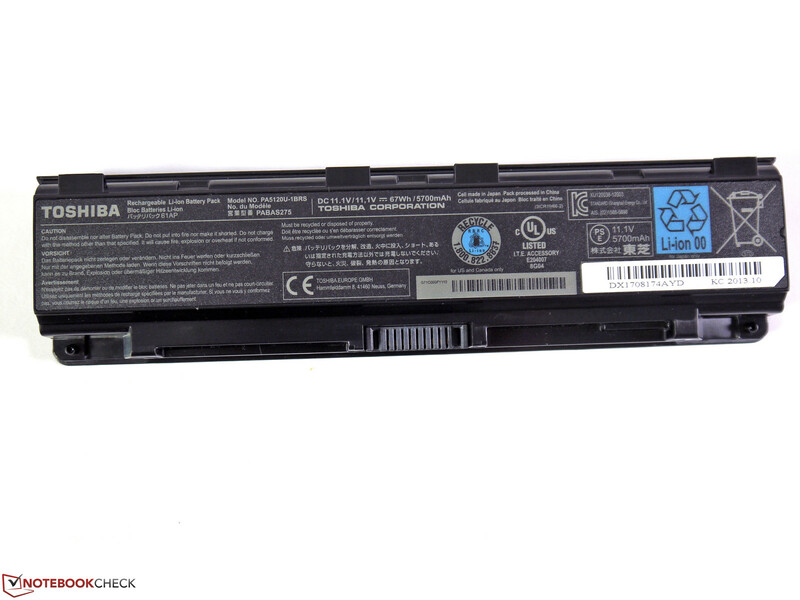 Dell Precision M3800, Dell Precision M4800, HP ZBook 15, HP ZBook 17, Lenovo ThinkPad W540, Fujitsu Celsius H730 and others.